The Thargoids are a mysterious alien race whose ambitions are quite unclear at the moment. Human civilization has tried, and is still trying, to understand their motives for nearly 180 years without success. However, many experiments have been conducted; Some even in ways that are not “politically correct” and extremely controversial, even condemned by the superpowers. 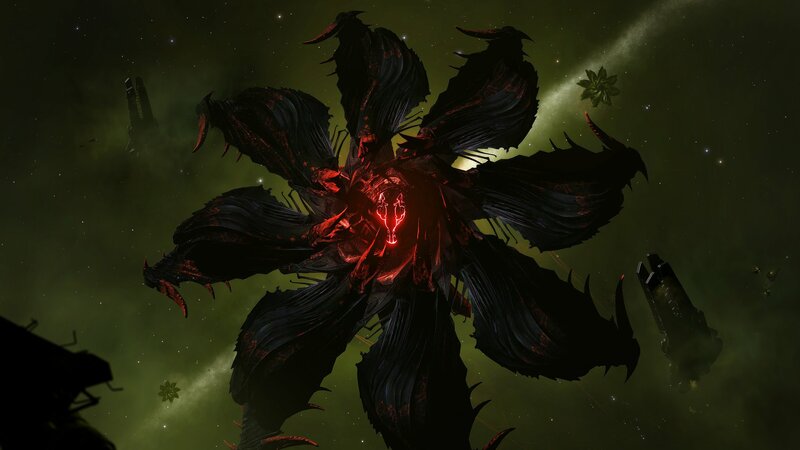 This article is dedicated to the science and many stories surrounding the Thargoids. Some of our previous articles have been consolidated in this unique article. Sources at the end of the article. 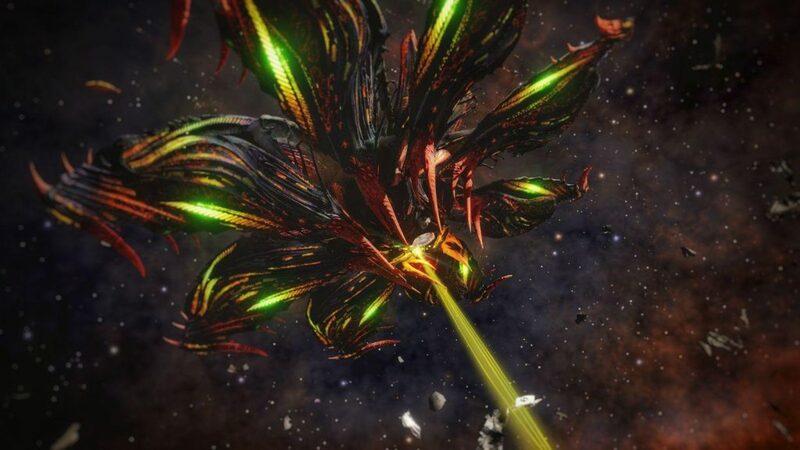 The Thargoids are an alien species discovered for the very first time by Lens Nikon in 2850, on the Veliaze system. While Lens was working on the terraforming of New Africa, he observed a gradual degradation of the environment and an increase in ammonia levels in the atmosphere and in the soil. 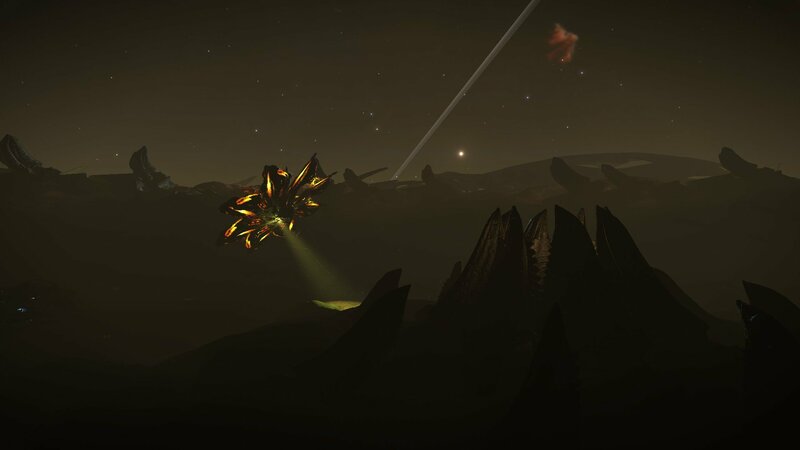 Some strange ships, more and more numerous every days, were passing at very high altitude; Thus he discovered an entirely different civilization and the first Thargoid fleet. Today renamed Epsilon Indi, it is here that the bugged planet is orbiting at a really fast pace in the system – Mitterand Hollow. The latter were surely interested in the planet, and might have wanted to terraform it, just like we were doing for our own benefit. Anyway, the Federation hadn’t made an attempt at opening communication with these aliens, and secretly sent a battalion to destroy the threat to their interests. 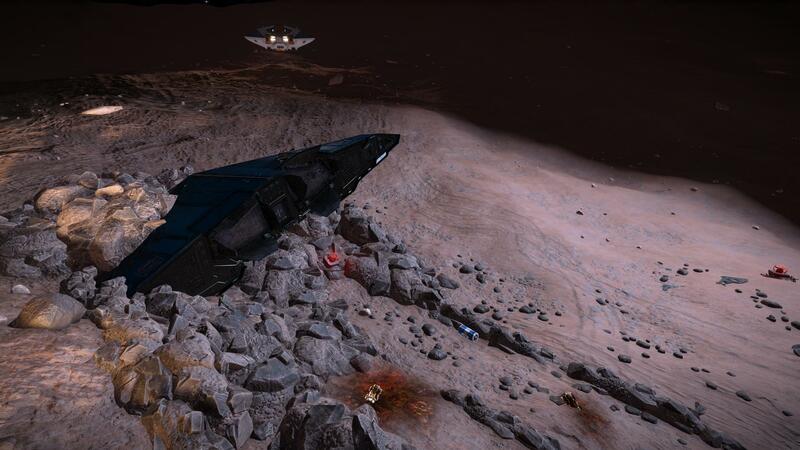 The Federal pilots destroyed this alien fleet despite their communications attempts. The Federation declined all diplomatic communications from the Thargoids, and the latter got exterminated on the spot. Victory! 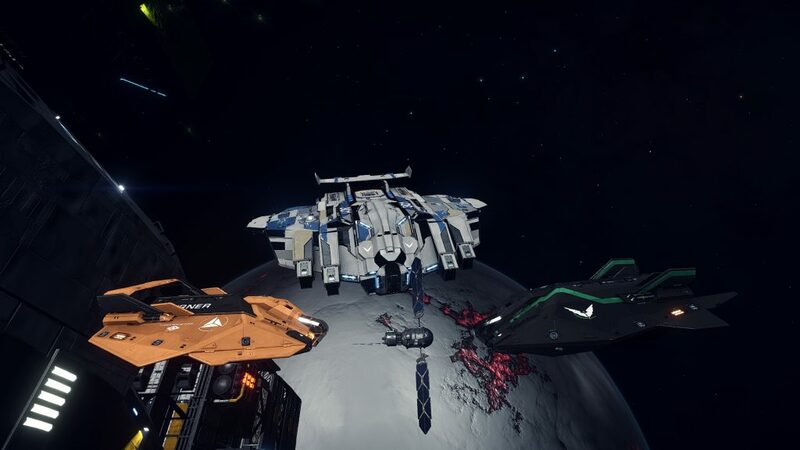 After a fierce face-to-face battle, the Federation troops withdrew through a hyperspace jump… it was then that they were all pulled out of WitchSpace (another name for hyperspace) and left in middle of nowhere, surrounded by thirty Thargoids mother ships and a gigantic fleet of ships and Thargon drones. Only two humans came out alive from this hell, terrified by their horrific experience, but unharmed. 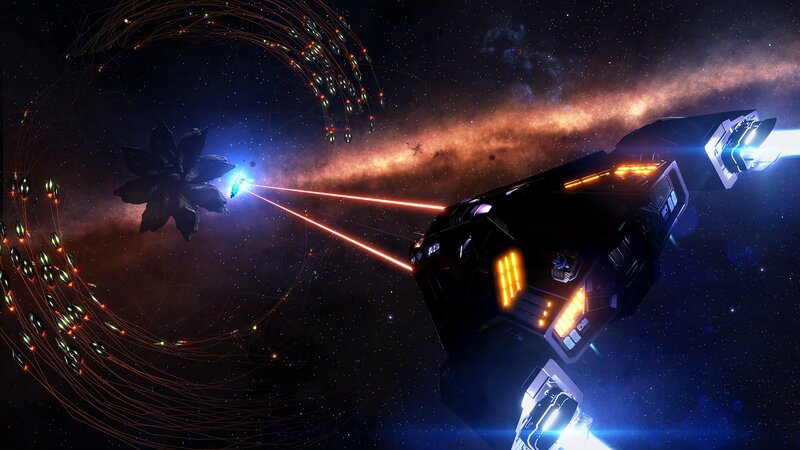 According to their reports, the Thargoids perfectly master the hyperspace jumps and can enter, exit or even navigate in hyperspace without problem. They would have tried to communicate with the humanity several times, but without great success, the latter stopping each diplomatic attempts, panicked and afraid. The war was therefore inevitable, and the Thargoids invaded the human space for nearly 343 long years including 96 years of intensive fighting. 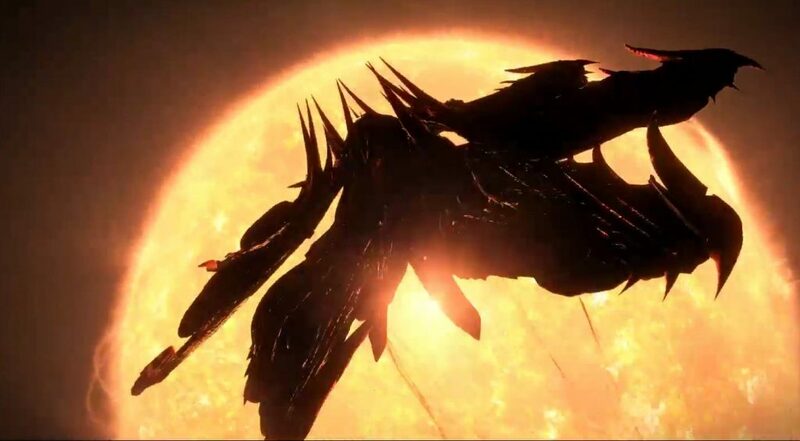 The Thargoid civilization is of insectoid type and could originally come from another dimension parallel to ours or maybe an other galaxy. They have a biological & mechanical chitinous exoskeleton, multi-jointed legs, 2 opposite fingers. 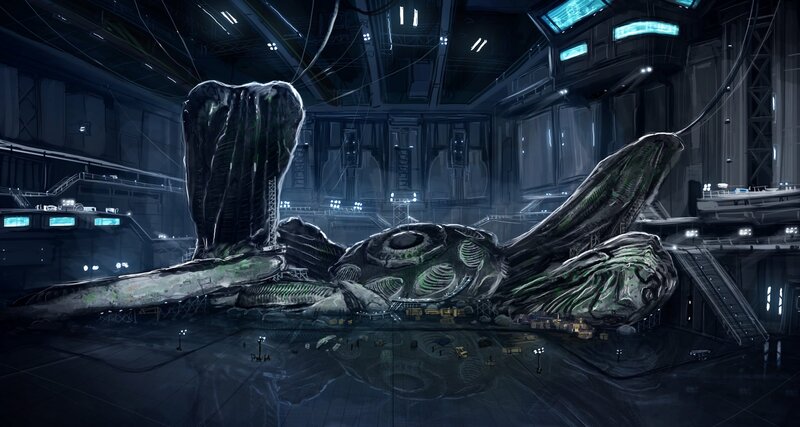 Many pieces of alien corpses were recovered during the Thargoid war and from the abandoned INRA sites that we will discuss in the next chapter; The morphology of these remains was of two distinct categories: those extracted from Thargoids’ shipwrecks and those discovered by explorers from other sources. The first are large, ranging from blue-green to grey, and suggest a body mass ranging from 2 to 5 times the mass of a 2 meters human. The others, described in detail in the Giomanst Encyclopedia, are black, human-sized, and have fewer joints. 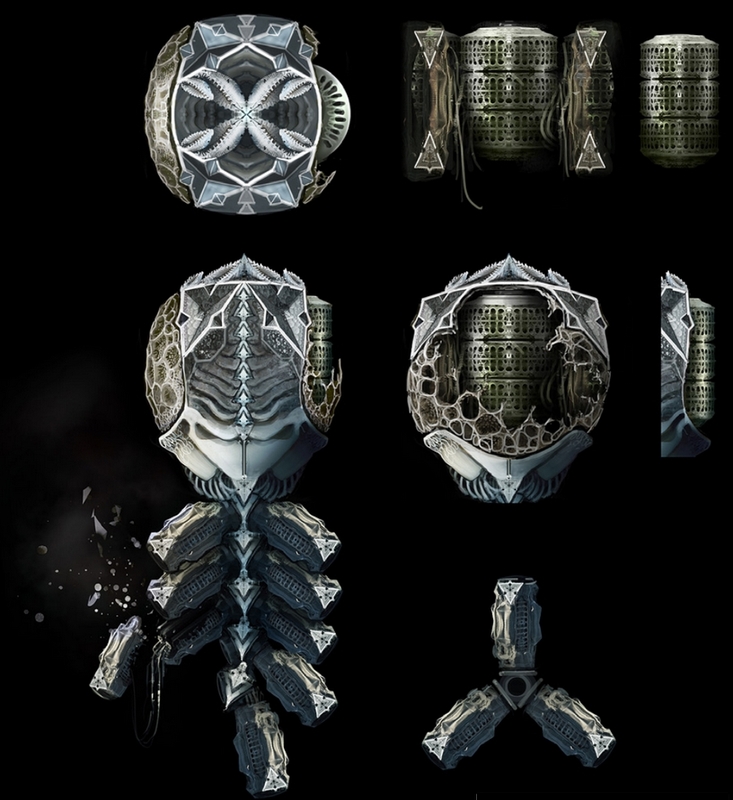 It seems reasonable to say that there are several variants of Thargoids ranging from the original to bio-mechanical engineered creations. It is also possible that when growing up, the Thargoids change variants thus representing a life cycle. They could sometimes be one with their mechanical creations. Their metabolism is supposed to be based on an oxidation/reduction principle, but an equivalent of the Krebs cycle has not been demonstrated. In terms of procreation, there are adult females called “Queens – Hive’s mother” capable of laying a succession of “drones”: sterile females without reproductive capacity. The Thargons “drones” are produced from eggs and driven to adulthood by a series of larval stages similar to other insect species of the known world. Any reproduction is done via parthenogenesis and there is no sign of the existence of a second genre. It is the only other living sapient space species known to date and is classified by the Federation as “very resistant and refusing diplomacy”. Who’s right ? Who’s wrong? Would the Federation try to hide its past mistake? Among other events, the Alliance of the Independent Systems was created in 3230 with the advent of the Alioth system. The latter was the scene of countless battles between the Empire, the Federation and the Thargoids. The Amalgamated Aerodynamics Silver Group is created by Meredith Silver and Mic Turner. They clearly announce their position for the Alliance and become the main shipyard and shipbuilder for this new power. 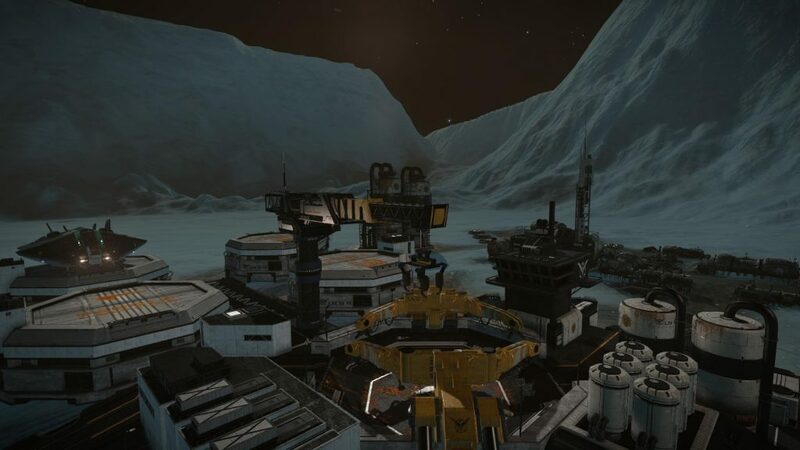 The shipyard is well known, it is New Rossyth. This shipyard is the most advanced of all and has the latest technologies recently developed. They aim to produce the best ships ever created. 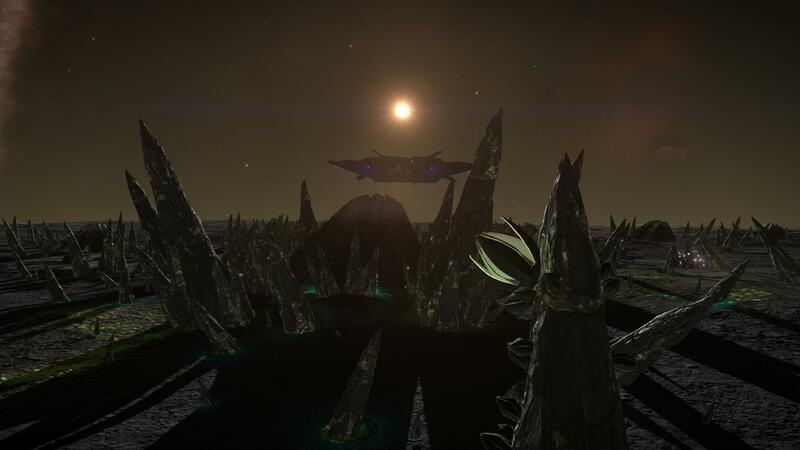 According to the Prime Minister of the Alliance, Edmund Mahon – who is one of the few individuals with access to the archives – the INRA has led a Xenocide war resulting in the total destruction of a sapient species. Thanks to the co-founder of the Alliance, Meredith Argent, they deligitimize the INRA because of their actions with the Thargoids, the Xenocide they committed and the end of their mandate. The Intergalactic Naval Research Arm is forced to dissolve in 3253. 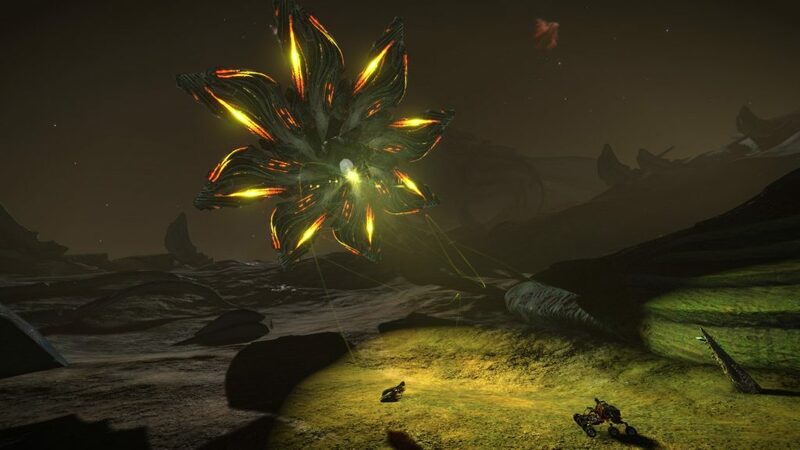 The events surrounding the first contact with the Thargoids were mostly suppressed (by The Club) and forgotten, and by the 3300s, the Thargoids themselves were generally regarded as fiction… except by some. For the record, The Club is a group of influential personalities who have been manipulating the course of the Humanity development for centuries. They claim to act in the best interest of humanity, guiding the species in its crises so that a maximum of humans survive. However, countless lives are lost because of them, used as unconscious pawns in their impenetrable plans. 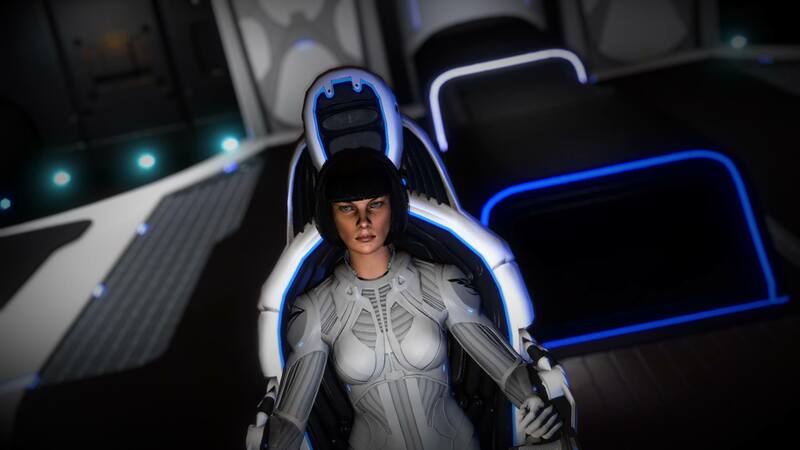 Exposing The Club and their knowledge of the Thargoids invasion was the last act of Kahina Tijani Loren. 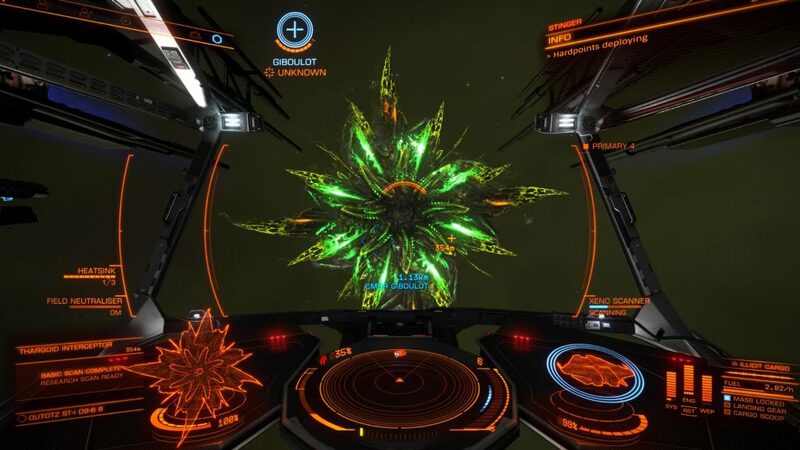 In January 3303 (2017), the contact with the Thargoids has been established again, after an explorer got interdicted during an hyperspace jump: an Hyperdiction. 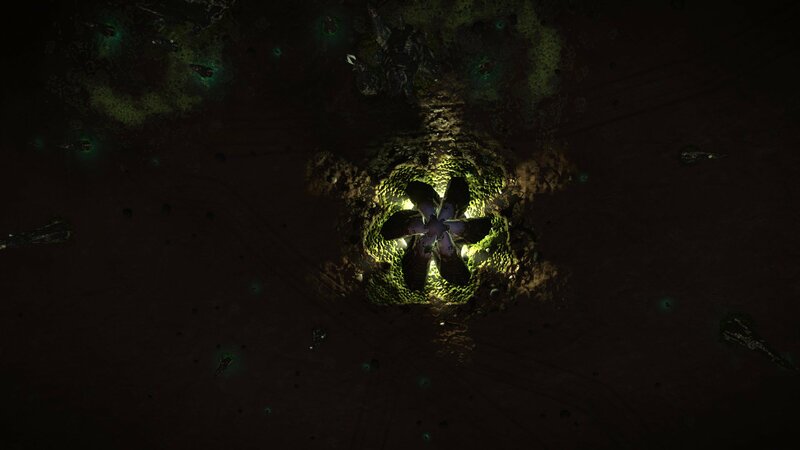 The mysterious Thargoids civilization prepared their return for decades. Is it for revenge? Or did we set foot on their territories with our uncontrolled expansions? Why are they only destroying some of the facilities supporting the AEGIS initiative and special laboratories/stations? The AEGIS is repeating the INRA’s past development plans and ambitions. 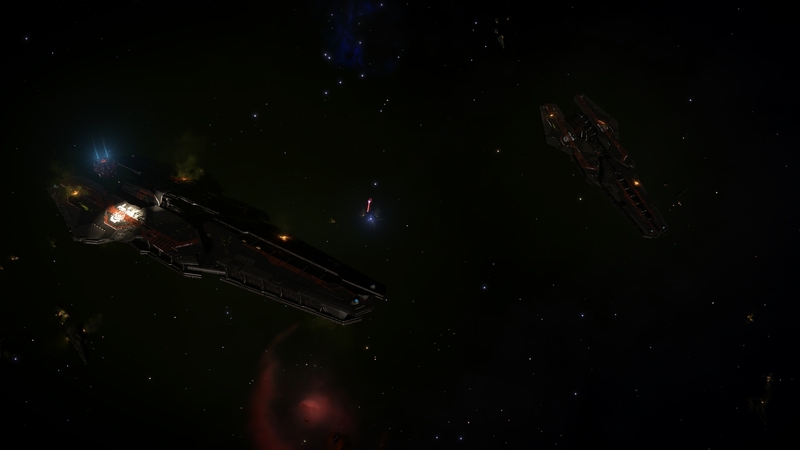 The ones that repelled the Thargoids and killed them all. 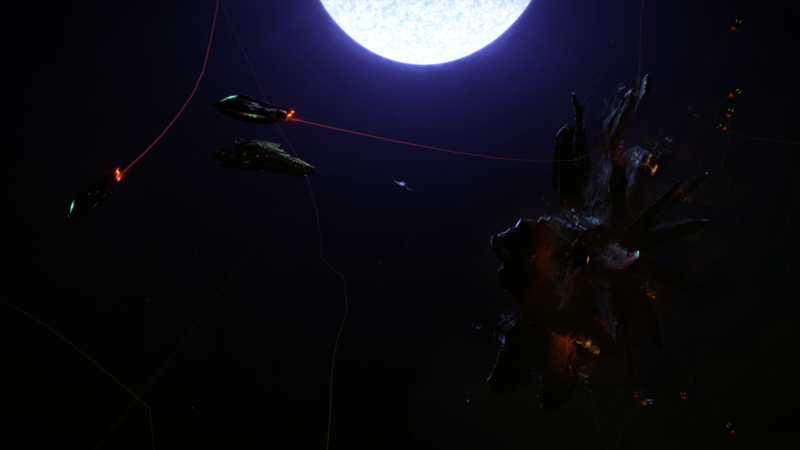 Sensors, Probes, Barnacles, Thargoids Structures, Links, Scouts, Interceptors Cyclops/Basilisks/Medusas/Hydra, Marauders Scouts… The AEGIS installations are also getting destroyed by the Thargoids in the Pleiades Nebula, close to the Human bubble. We are witnessing an escalation between our two species. 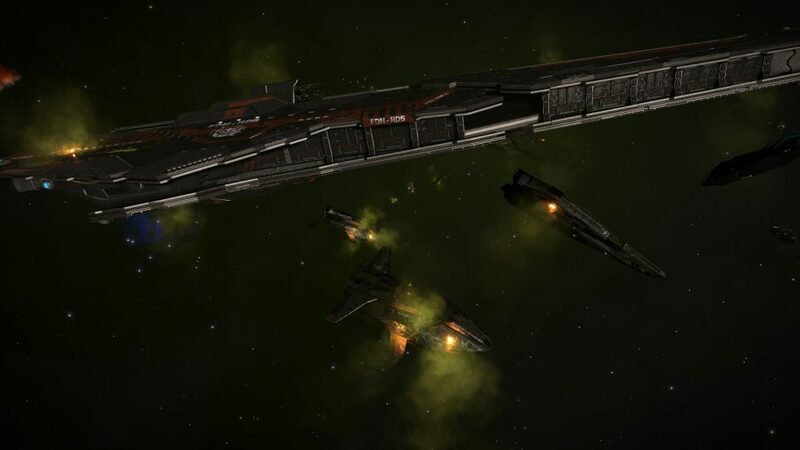 The war is now on as the Federation and the Empire send fleets to destroy the Thargoids detected in our borders. The Alliance is also helping while being more reserved, as it continues its research and developments in the California nebula, far from our eyes… where will all of this lead us to? 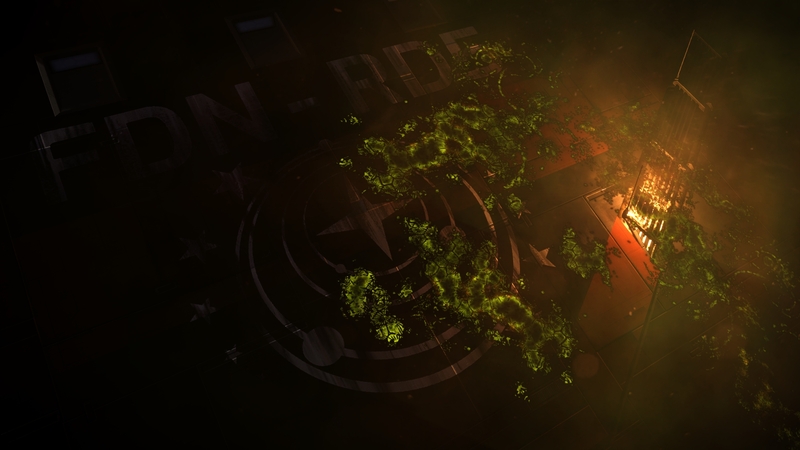 The INRA is a former scientific organization created in 2900 that aimed to analyze the Thargoids, however the military takeover and the discovery of a developed Mycoid virus changed the game. The latter assures itself as an organization developing twelve projects thanks to the Empire and the Federation coalition. The organization worked on the breach thanks to a mandate that allow their existence as long as the Thargoids were present in the human space. They tested new weapons to repel the Thargoids, new technologies, or even led research on hyperdrive jumping capabilities. Many experiments were conducted on living Thargoids specimens in the shadow of the media and led to the hazardous development of the Mycoid virus. 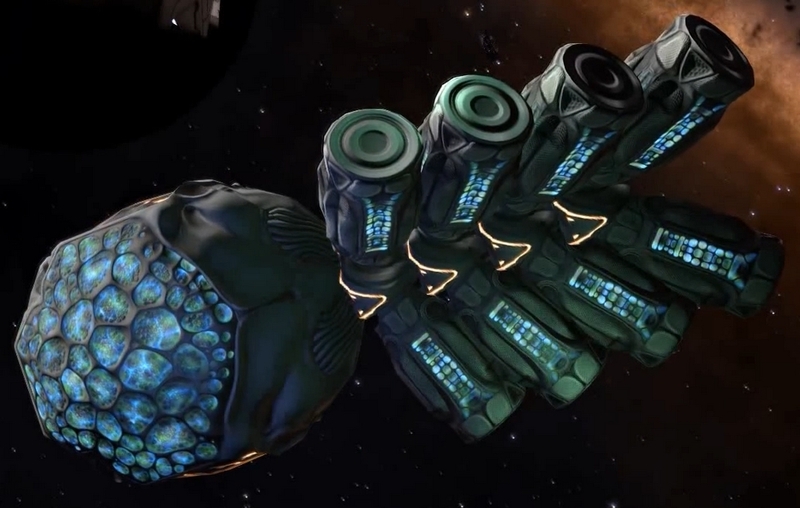 This biological weapon was based on a young agrology scientist who sought to eradicate famine in the world, using Thargoids ships tissues and various fungi. His project went well beyond his expectations and attracted the attention of senior military officers overseeing the twelve scientific projects of the INRA. After millions of credits spent in the Mycoid research, a biological virus was created. This mass destruction weapon was extremely effective against the Thargoids as it literally ate their bio-mechanical ships… as well as the aliens themselves. It did not take long to repel the Thargoids using terrible virus. Discovery of the Thargoids in 2850, development of the INRA in 2900, Mycoid virus in 3151 and end of the invasion in 3193. 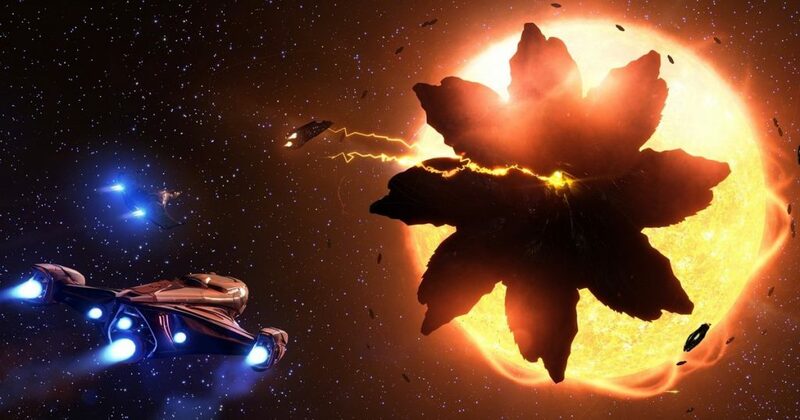 The great war against the Thargoids lasted 96 years with battles between the two civilizations during 343 long years. This compound attacks the chemical polymers of which the Thargoids are composed, we speak of a xenocide. In 3151 when the Mycoid virus was all ready to be used, the Commander John Jameson was deployed to deliver this weapon against the aliens using missiles fired directly at a Thargoid mothership. 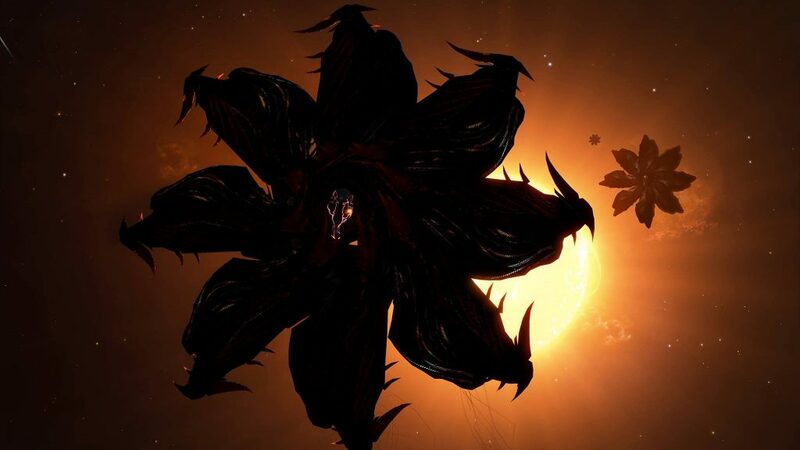 The virus should theoretically only have disabled the Thargoids engines and spread through all their ships, however a side effect was known by the high-ranking officers… the virus would also literally ate the Thargoids themselves. 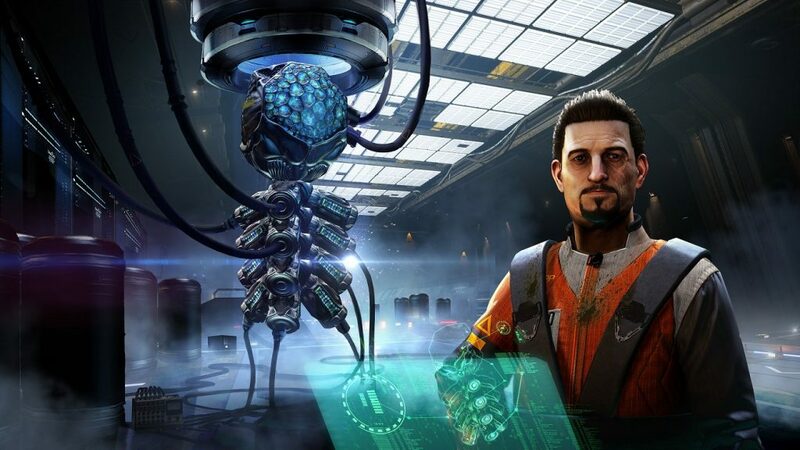 Horrified, John tried to return to his base, but a device attached to his ship by INRA officials got activated: he must not return alive from his mission. His secret must be buried, the Thargoids must be defeated, whatever the price. The Thargoids therefore retreated in 3193, having lost an immeasurable number of lives. The INRA lore looks alike the new AEGIS organisation… which isn’t very flattering, and many pilots are wary. 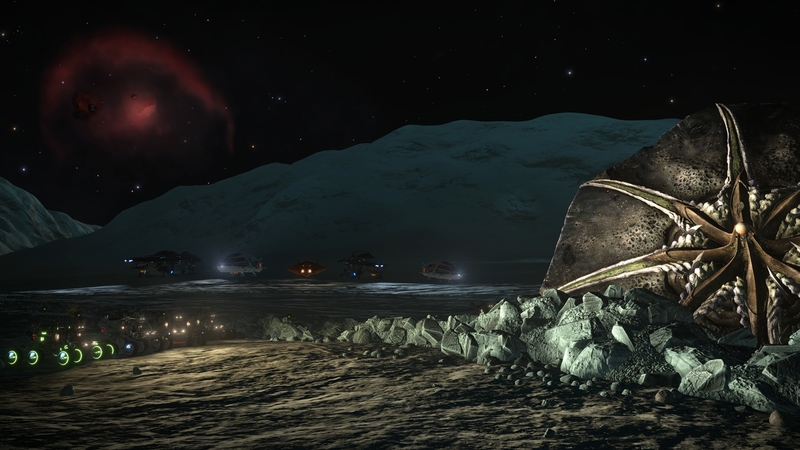 Learn from the past, thanks to these logs extracted from their many discovered sites’ databases on the surface, from numerous planets in the bubble. 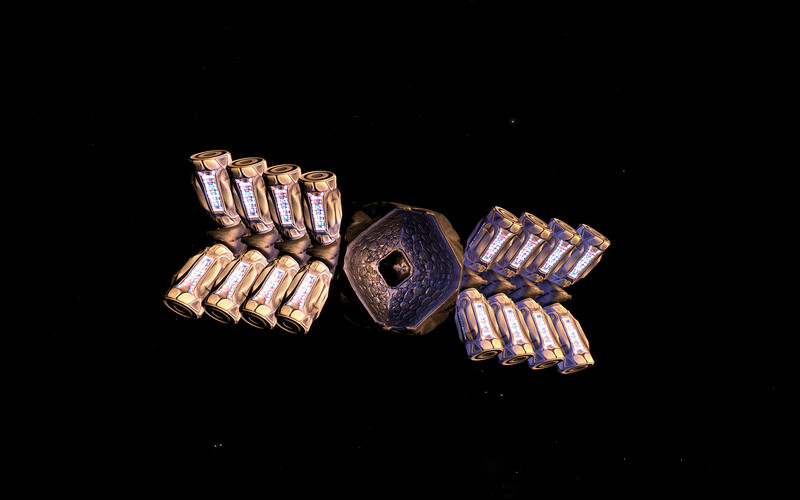 Personal Log: Bexley Prince, Chief Researcher // We received a very exciting delivery today: pieces of recovered Thargoid technology, even fragments of spacecraft. Most of the samples are damaged, but we should still be able to put them to good use. Thargoid technology is, in many respects, far more advanced than our own. Understanding it could open up all kinds of possibilities and rapidly accelerate our own development. Space travel, energy, weapons, even medicine – the applications are potentially limitless. I suspect there’s a key discovery to be made, one that will open up the aliens’ technology to us. Who knows? Perhaps I’ll be the one to make it. But I’m getting ahead of myself. There’s lots of work to be done before we can start popping champagne corks. I’ve given the research teams their assignments. Let’s see what they can find out. Naturally our employers keep an eye on us – the work we’re doing is extremely sensitive. We’re researching alien technology, after all. It’s a question of security. Some people can find a conspiracy in anything. He’s a specialist in agricultural science, trying to wipe out famine or something, Apparently he’s created a biological agent that incapacitates the alien technology. Here we are, devoting millions of credits and countless hours to understanding this technology, and he’s trying to destroy it. If it were up to me I’d cut him from the project entirely, but our employers seem to think his work has merit. I don’t have long. Once they realise I’m gone and the data has been copied, they’ll send their attack dogs after me, I know they will. But someone needs to show the galaxy what the INRA really is – what it’s doing, what it’s hiding. I’m sorry for the part I’ve played in this. Truly. 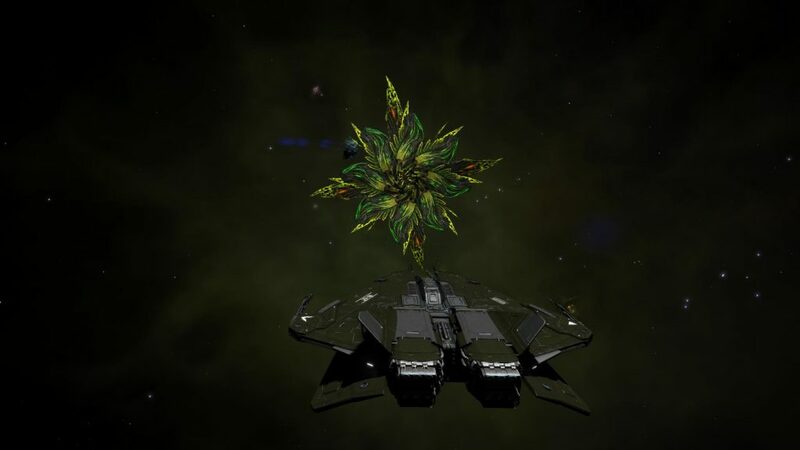 I was a researcher at a facility in the Hermitage 4 A system exploring agricultural applications of Thargoid-derived technology. The lab was owned by the INRA. Publicly, the INRA likes to emphasise the whole altruistic and cooperative thing, but in recent years it’s become much more focused on weapons testing and manufacture. Believe me, it’s a military contractor in all but name. The nature of my field was the study of disease-resistant crops and mycoproteins, that sort of thing. I was getting good results, even if my superiors took no notice. Then everything changed. I was running a bunch of control experiments, just trying a few things out really. It was an afterthought – it wasn’t even related to the main body of my work. The results were interesting and I didn’t think they were particularly significant, but something made me take it directly to one of the INRA guys. I didn’t want to go to Dr Prince, she’d always been pretty dismissive of my work. I would give anything to be able to undo that decision. Anything. All my equipment and samples were whisked off to some remote facility. Later, I found out they’d been taken to a weapons-testing site in the Alnath A 2 A A system. 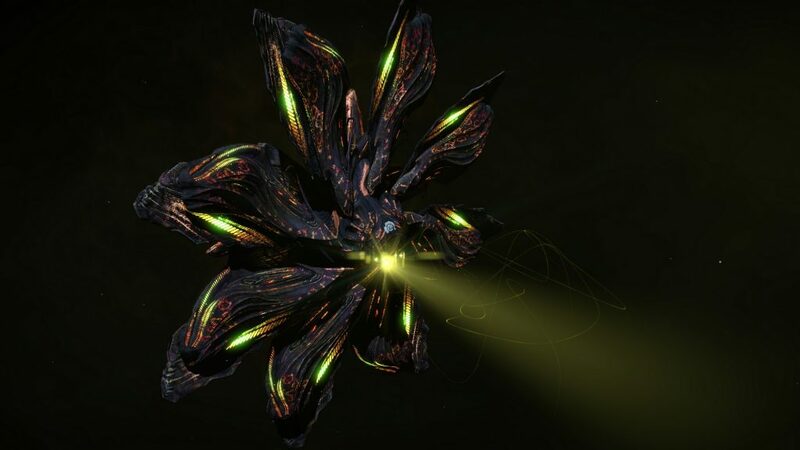 My research was used as the basis of a new super weapon designed to destroy the Thargoids. I heard they experimented on live captives. I doubt any of it was strictly legal. It certainly wasn’t ethical. To the public, the INRA is a symbol of all that is possible when superpowers set aside their differences and work together. Well, it might have started off like that, but it’s something very different now. Progress at any cost, might makes right – all our worst impulses channelled into an unaccountable organisation focused solely on making bigger and more powerful weapons. Bigger and more powerful weapons. God. If you find this… if someone finds this, make sure it gets out. Please. It’s time people knew the truth. Finally, we have a breakthrough. 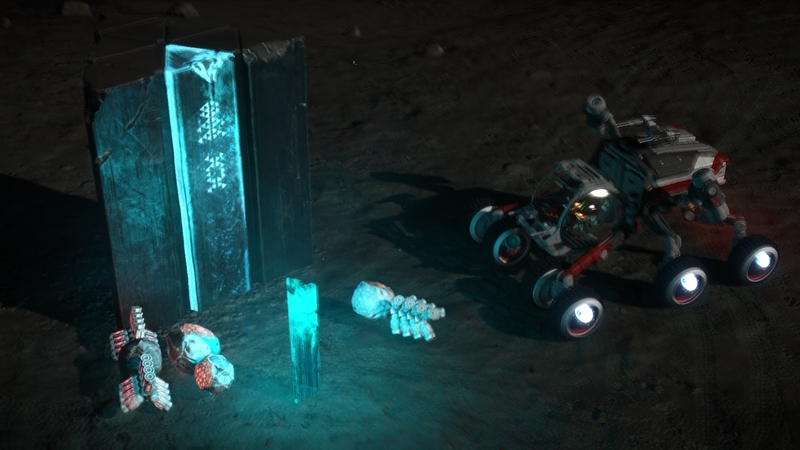 A researcher at the facility in the Hermitage 4 A system has found something – stumbled onto something, by all accounts and it’s pushed our research forward dramatically. 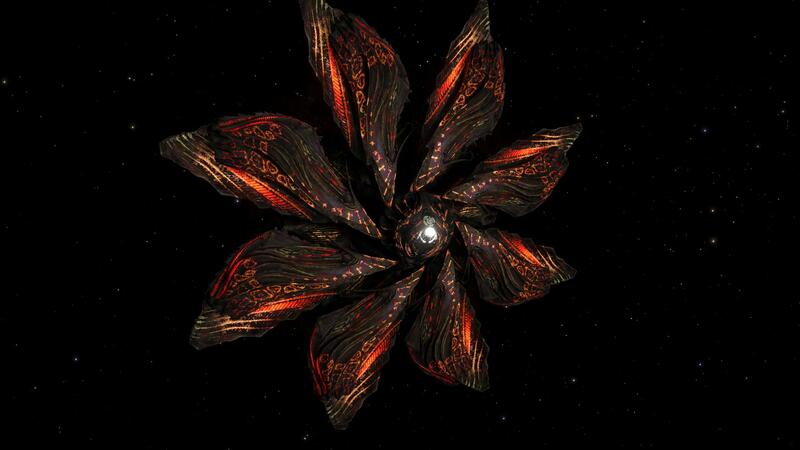 Essentially, it’s a kind of fungus – one that appears to have a significant effect on Thargoid technology. We knew their tech was partly biological, but until now we couldn’t find a way to use that fact to our advantage. The theory is that if we could somehow get the fungus into their starships – specifically their hyperdrives – we could shut them down. They’d be unable to leave their system. We could end the war in a single stroke. So far, our experiments indicate that the fungus affects not only the Thargoids’ technology but also their physiology, as evidenced by the degeneration of our specimen. These results are highly encouraging. If the mycoid can hurt them – truly hurt them – we may have found the means to win this war. Our latest tests were extremely successful. 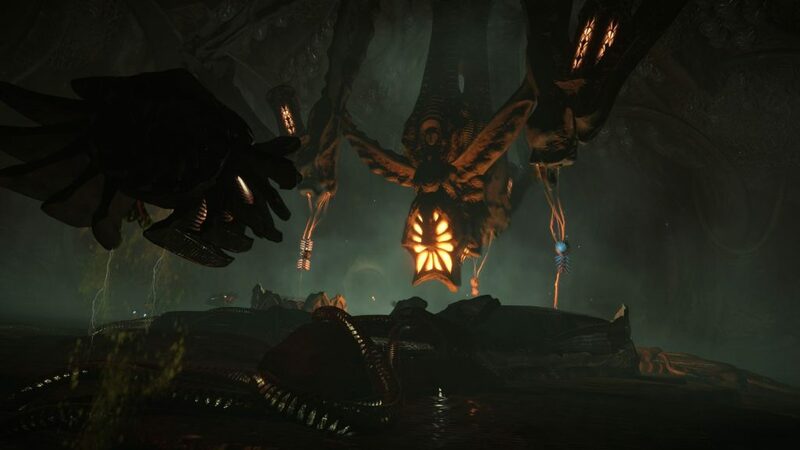 The mycoid can paralyse a Thargoid system – either physical or technological – in a matter of seconds. It is extremely effective. I confess: the knowledge that the mycoid causes the Thargoids physical pain brings me some measure of satisfaction. But when one has seen, first hand, the effect of their weapons – seen the destruction, the chaos, the bodies – can one be blamed for wanting them to suffer, as we have? 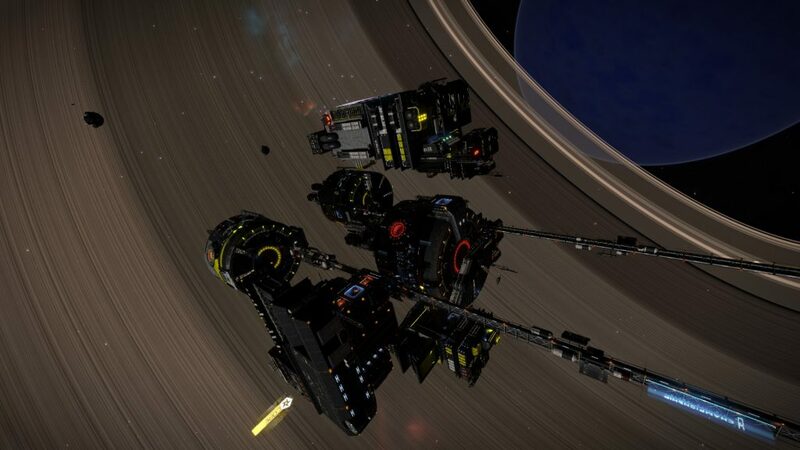 The haulers have departed for the HIP 59382 1 B system with the samples, ready to start mass production. We know the mycoid works. Now it falls to other members of the project to determine how it can be effectively deployed. I understand that this is lucrative contract, but I really think we need to take a second look at the production schedule. We have neither the facilities nor the workforce to deliver what’s been promised. Furthermore, the facility should be subjected to a complete decontamination before we start. That could take weeks. Essentially, we can’t produce the chemicals in the quantity requested within the given timeframe. It just can’t be done. I’d also like to renew my request for more information on the purpose of the chemical. Welcome to the position of Site Manager. We are looking forward to working with you on the mycoid project. I understand that you have raised questions regarding the reassignment of your predecessor. It was decided that her experience and expertise could be put to better use in another part of our organisation. Our analysis has confirmed that the latest batch was contaminated, and is therefore useless. I’m sure we hardly need remind you how essential it is that this project proceeds without complication. The cause of the contamination must be determined immediately. Every day the haulers come, dropping off more of the stuff. Others come to pick it up. We’ve been told not to ask questions. See, there’s rumours it’s some kind of pesticide, right. But with the amount we’ve got in storage, they must be expecting one hell of an outbreak. Some of the top brass from INRA’s visiting. The boss said he was here to talk about investment, but this guy had a military smell all over him. I know the public thinks that INRA is this great cooperative enterprise, but I don’t buy it. I think there’s more to them than meets the eye. One thing’s for sure – they’re running the show here. I was talking to one of the hauler pilots down the docks today. According to her, this is all part of some kind of top-secret anti-Thargoid weapon thing. Apparently they’re flying the stuff to a med-research facility in LP 389-95 7, wherever that is. She reckons, this has been going on for months, at sites all over the galaxy. So it’s not pesticide then – well, at least not in the conventional sense. I don’t know who they were, exactly. Some corporate bigwigs. But they definitely convinced the board. I can’t say I’m surprised. They offered a lot of money for access to our labs apparently. The board probably didn’ t even ask what they wanted them for. At least I got the bosses to promise the lab wouldn’t be used to make biological weapons. This is a medical facility, after all. I will not be bullied into participating in this so-called war just because some corporation gave us their money. It turns out they want us to make some kind of vaccine, an antidote for an unnamed biological weapon. They’ve given us samples and data, but whenever we press for more information our requests are met with silence. We re working in the dark. With our hands tied behind our backs. In practical terms we’ve got everything we could need, but I have no idea where half of it comes from. They’ve given us material the weapon has been tested on, both organic and inorganic, human and nonhuman. I’m starting to wonder if the weapon is even designed to target humans. We’ve finally been given access to a sample of the weapon, and it’s opened up all kinds of avenues. I still worry about the ease with which our benefactors acquired the samples, but I’m probably just being paranoid. They obviously have deep pockets. Having access to unlimited funds must open all kinds of doors. After months of research the solution ended up being pretty simple. Once you break it down it’s a fairly straightforward organic compound – little more than a fungus, really. We tested the vaccine on some of the older samples, and while it doesn’t undo any existing damage, it does prevent the weapon from doing any further harm. Our sponsors certainly seem happy. The lab is being dismantled. Seems our sponsors want to move us to a new location. Their representatives appeared a few days ago, demanded that all data be transferred to their servers and all samples be put into storage, ready to be moved. Why are they doing this? The lab more than meets our needs – they made sure of it. I tried to talk to them, but I just got stonewalled. Apparently all information is on a need-to-know basis. And I don’t need to know. 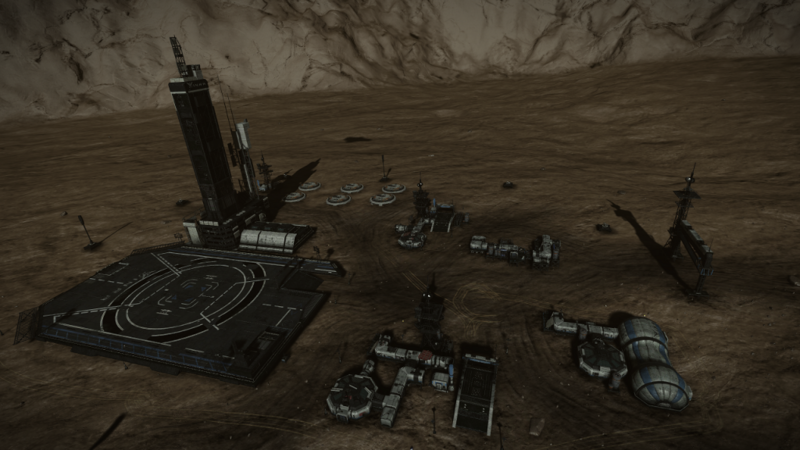 If the thargoids take the bait, this facility should come under attack very soon. And when it does, we’ll find out if our new weapons are worth a damn. It’s taken a lot of time and effort to make this place look like an important military site. I just hope they fall for it. It’s about time we started fighting back. Everyone’s on edge. It’s like seeing an approaching storm and waiting for it to break. The air is heavy with the threat of violence. Maybe they didn’t take the bait? Maybe we hid it too well? Or maybe we didn’t hide it well enough. What if they realise this is a trap? I suppose it’s too late to worry about that now. All we can do is watch the sky, and wait. 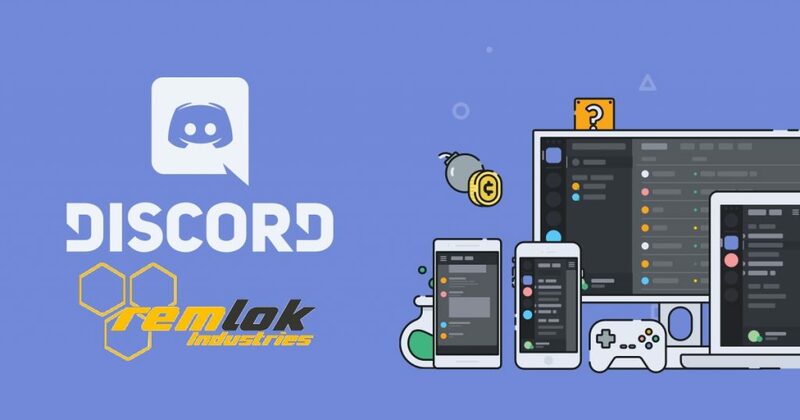 Contact confirmed! 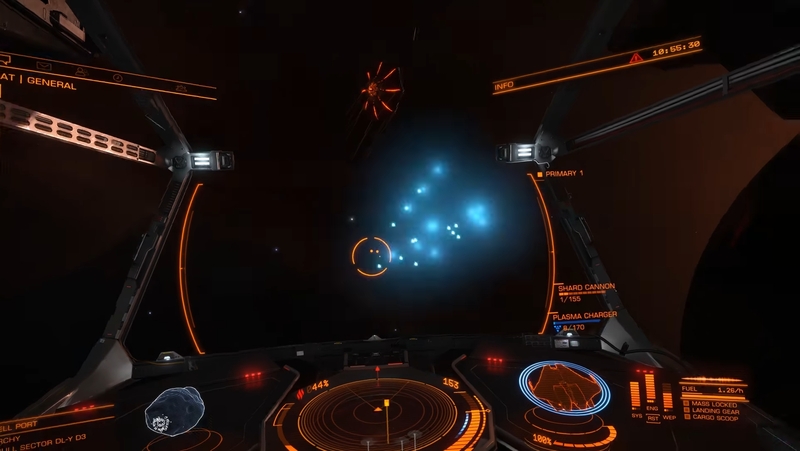 Thargoids 1,000 light seconds from the site and closing. Ready all weapon systems and prepare to fire on my order. We’ve only got one shot at this and I don’t want to miss. Wait… wait. What is that? 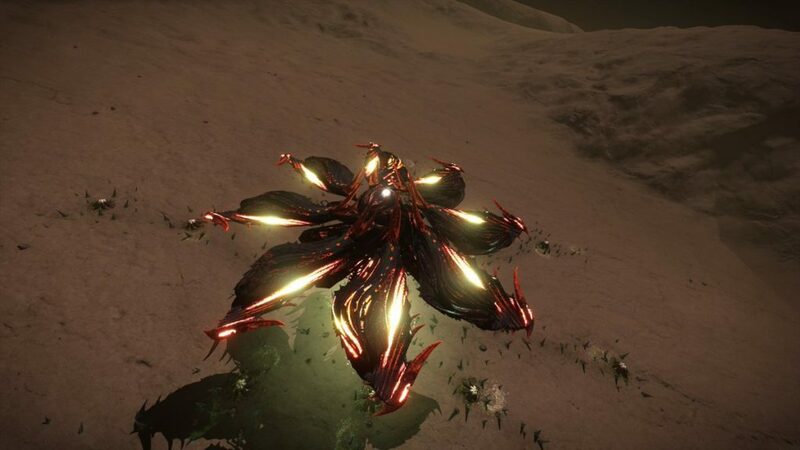 That’s not a regular Thargoid ship. It’s huge. Will someone scan that thing! And tell command we’ve got a mothership here. Get them the data as soon as possible. All right, all right, that’s close enough. Fire all batteries! Always the same results. I keep telling them: there’s only so much we can do with the samples we’ve been given. We need a living specimen. Apparently they listened to me. We’ve been asked to build some testing apparatus and a secure enclosure. I drew up a preliminary specification but was told that the enclosure needed to be more robust. The specimen arrived today. The security reports indicate that it made several escape attempts, the most recent of which results in a number of deaths. We must take every precaution. The specimen appears to be in poor physical health, but it’s undoubtedly alive, and it will certainly serve our purposes. The specimen is highly resilient and seems to be able to withstand severe physical trauma, even to the point of losing limbs. I am reminded of pulling the legs off spiders as a child. Fortunately, testing on a nonhuman means no legal red tape to slow things down. I’ll admit I had my reservations about this Commander Jameson. I looked into his background and apparently he climbed the ranks of the Pilots Federation with unprecedented speed. He’s revered by other pilots. But that doesn’t mean he’s suited to the task. But then it struck me – all we need is someone who can get the payload where it needs to go. The hard work – the development of the mycoid – has already been done. All Jameson has to do is push a button. The important thing is to play up the whole ‘saving humanity’ angle. Make him feel like a hero. That should stop him asking too many questions. Having received the payload from the Alnath system we’ve prepared a number of medium-range missiles loaded with the weaponised version of the mycoid. Jameson will be here in three days to prep for the mission, which should give us more than enough time to fit his vessel. Apparently he insisted on using his own ship. I’ve also ordered that some special modifications be made to his craft. He’ll have to get close to launch the missiles, so it’s unlikely he’ll be coming back. But if he does survive, there are contingencies in place. The consignment has been loaded onto your ship. We have made some minor modification to your vessel, but it should not affect the performance or functionality in any way. 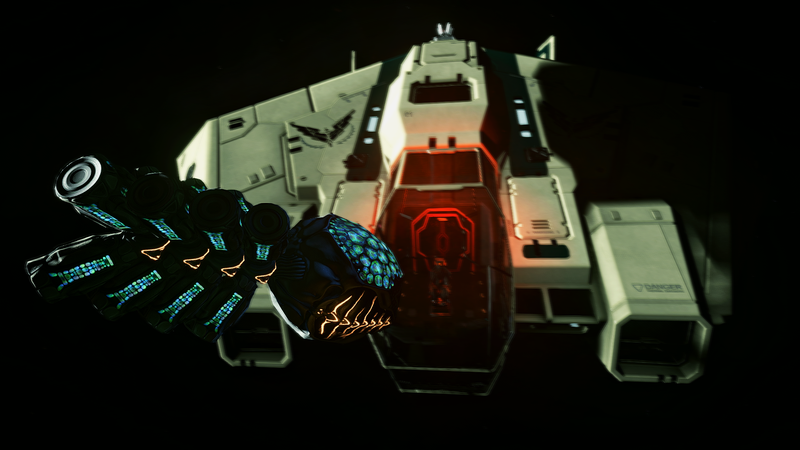 This is an extremely dangerous mission, Commander. You will be heading deep into enemy territory. If anything goes wrong, you’re on your own. Good luck, Commander. The future of the human race is in your hands. All our hopes and prayers go with you. An old version of a Cobra has been discovered in the system HIP 12099, planet 1B, coords -54.36 / -50.36. The first Sensor, or Unknown Artefact as they were known before, was discovered in May 3301 (2015) in a cargo ship, highly protected by many Federation ships. These Thargoid Sensors are typically found near Interceptor crash sites, but can now be found in different non-human signals. Extremely corrosive, they must be transported in anti-corrosion cargo racks, otherwise damage will be applied to your ship. 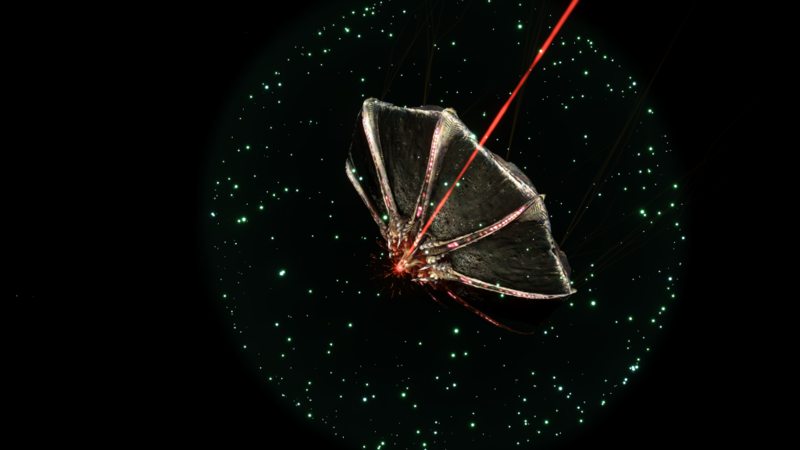 When dropped into space, they will scan ships and stations ~1km around them, point slowly to the Merope system and then emit a distorted Morse signal. You’re here to do science, right? 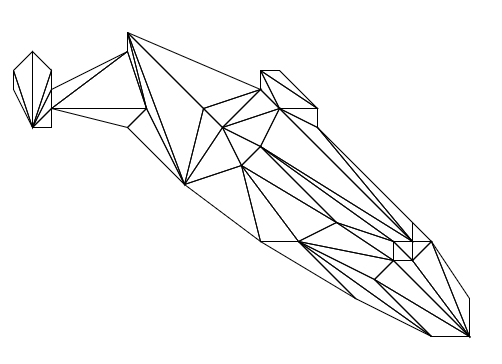 So click on the following spoiler to learn how to create your ship in Wireframe, like the Diamondback below! 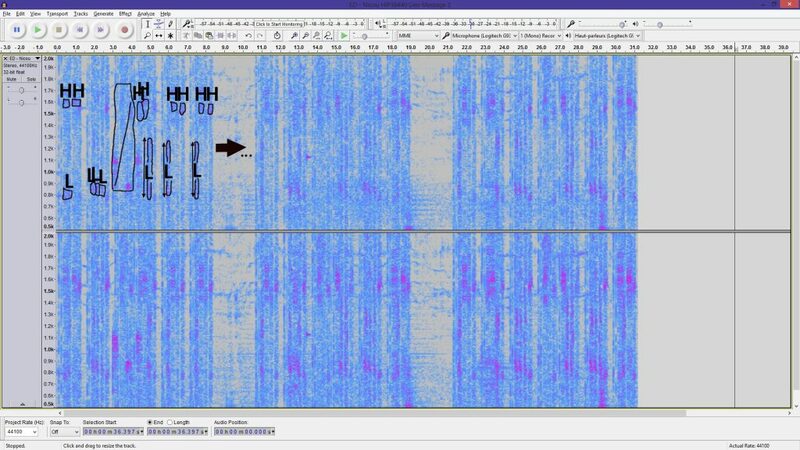 Load the recorded sound on a digital sound recording and audio source editing software, such as Audacity, and use a Spectrogram mode. Fine-tune the settings to get a better look at it. Something like: 2000 Hz max, 5 dB gain, 50 dB range, 2048 window size for example. 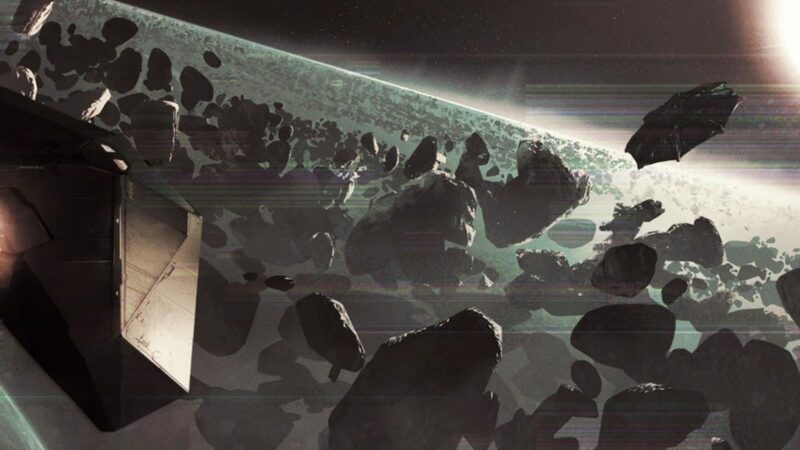 The Probes, also corrosive, play an important role in the understanding of Thargoids and are useful to open the Thargoids Structures, on the surface. 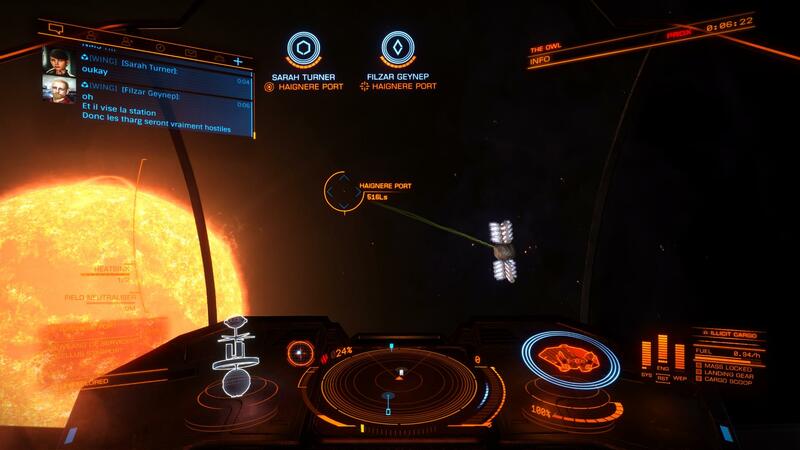 When scanned using a Discovery Scanner, they emit a powerful wave of energy that will partially disable your ship. You can find them around ammonia worlds in very low orbit, or in non-human signals more frequently now. When they emit their EMP pulse wave, a sound will be played and it can be translated using a spectrogram to find an interesting image. As always, record that sound and load it into Audacity for example. The sound contains information in Morse about temperature, gravity, diameter, atmospheric composition and distance from Col 70 Sector FY-N C21-3: Merope 5 C. Indeed, if the Probe is near this planet, it aligns with it, pointing in the direction it emits to. The reference system on Col 70 Sector is currently blocked by a permit, and we can access it. Found more easily in the Non-Human Signals (0 to 5), for example on HR 1185. If not you could try your luck in very low orbit, close to ammonia worlds, like HIP 15310. 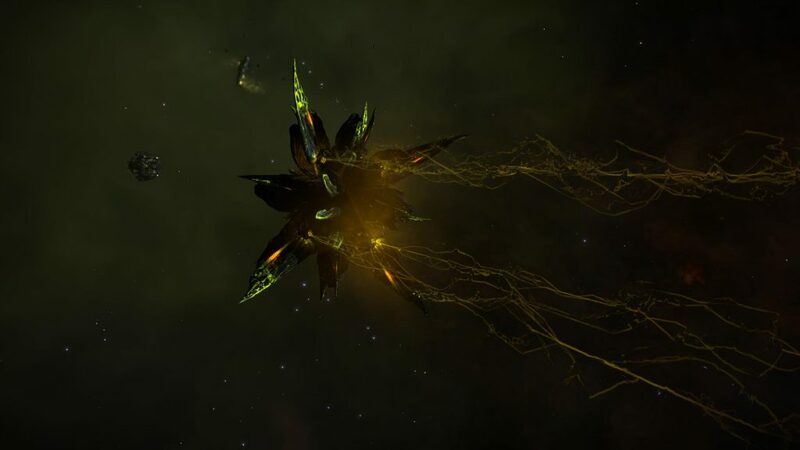 Found only within the Thargoid Structures, the Thargoids Links are used to locate new Structures and point to different points in space, where Thargoids will launch assaults. These destinations are calculated using the Eagle Eye Installations processes, which can be found at the end of this article. They answer back to the Sensors and Probes communications, even if their “discussion” is not really important. 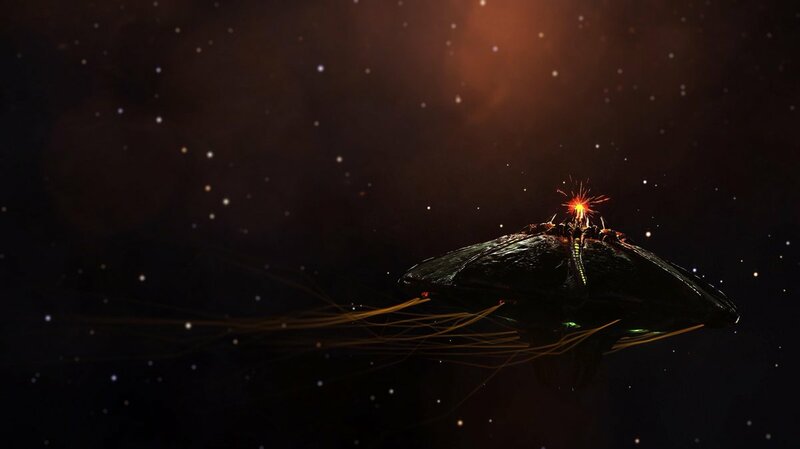 They transmit a message through their antenna that can be analyzed when you play one of two or three messages received by the Thargoids Device. We will discuss its decryption in the last chapter. 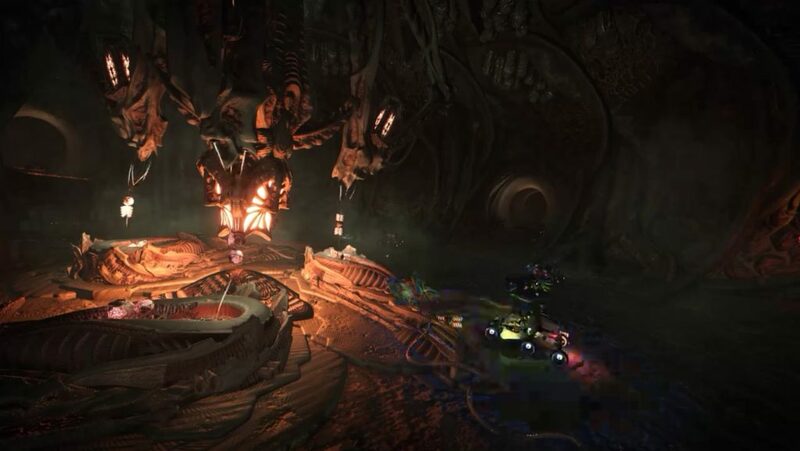 They point to a destination, according to the message played: a barnacles forest, a Thargoid structure, a Human station, INRA sites… everything can serve as point of reference/destination. 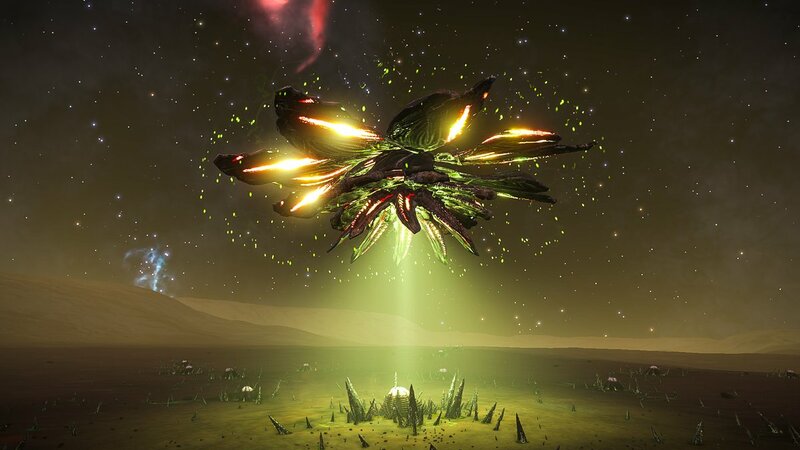 This is a form of Thargoid life, yes, these Barnacles are living entities. Tities! Sorry, I’ve been working for so many hours now hahaha! They emit sounds that we do not understand yet. Many materials can be found on these sites, even the famous Meta-Alloys that we now know how to synthesize on Maia – Darnielle’s Progress. These are extremely effective & robust to repair the damage caused by Thargoids while effectively countering corrosion and heat. We have been able to create various technologies, including anti-corrosion cargo racks. 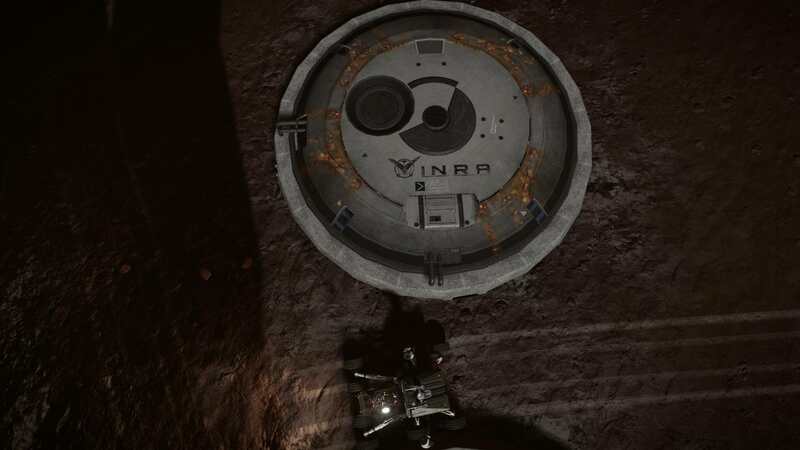 This is where you can find Links and the very important Thargoid Device visible on images 3 and 4. There are currently 230 listed on Google Sheets. If you have a Probe and/or a Sensor, you can enter and visit the inner rooms. Scavengers are here on-site. There are one to two rooms filled each with three Links + a central room with the Device in there. Place a Sensor, a Probe and a Link as requested by the central device on the floor plates to turn it on. Scan it to activate it, and admire the result! A sound is also audible and can be translated via a spectrogram, again. It is a map showing the Merope system on the left and another unknown system on the right, the three Thargoids objects, 1 2 3 in Morse, …. We think it’s a plan showing how to use the link and retrieve destinations thanks to references. 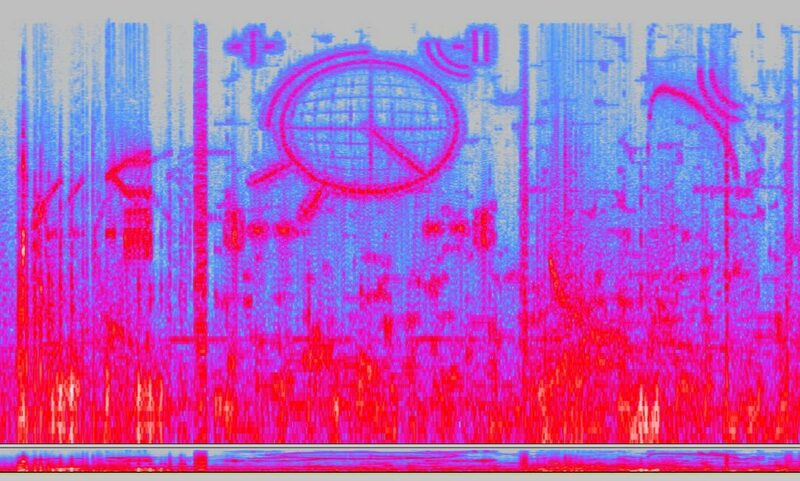 Some time ago, explorers detected Listening Posts, which, after triangulation of the received data, pointed to a large structure on the surface of a planet. But the most striking facts come from the nearby Megaships we discovered: Pandora and Victoria’s Song. The latter were on a scientific mission when they detected a large structure on the surface of a planet… when they approached, it appears that security vessels opened fire and killed the crew entirely. It is therefore about assassinations in order to hide these discoveries to the galactic community. 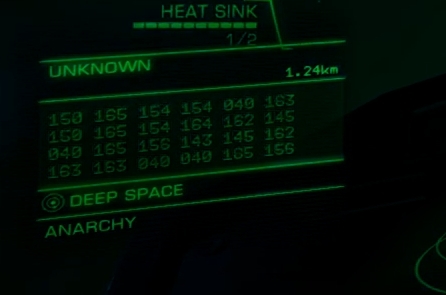 The data stored in these two Megaships have, after analysis, given two specific details: a system, and a planet location. The scientists went there and discovered these gigantic alien structures. On-site, experiments are conducted by hundreds of scientists from the galactic community. 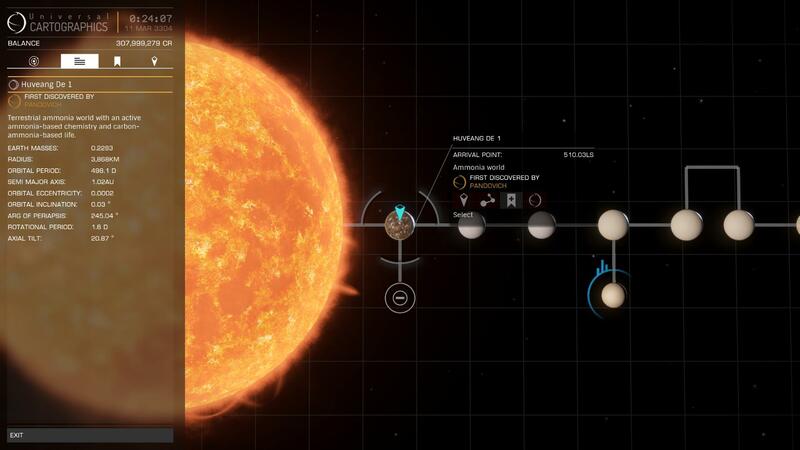 You already know how to interact with these sites thanks to our “How to – Thargoids Structures Guide” (don’t you?! ;)). Here are many Scavengers, kind of small reddish drones moving wrecks, Meta-Alloys spikes, strange eggs on the ground and on the walls of some tunnels, small fumaroles, some sort of green containers that contain Thargoids commodities, communications systems, the number of which varies from one site to another. Structurals – Organic tissus, multi-layered armour, irregular scales, oligomer crystals (DNA), 80% organic structure, corrosion and fractures detected. After performing the required manipulations in the structure, and activating the Thargoid Device in the center of the main chamber, three messages are sent to the players (two from now on as the Thargoids understood that we hacked their systems, and are trying to counter us). These audio messages are information leading us to destinations like other Thargoids Structures, Humans sites or even next systems that will be assaulted by the Thargoids! 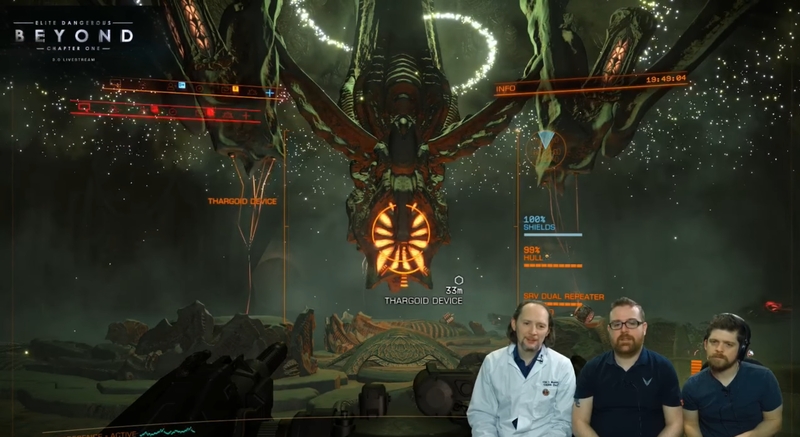 Après avoir réalisé les manipulations requises dans la structure et activé le Dispositif Inconnu (UD), au centre de la chambre principale, trois messages sont envoyés aux joueurs (deux si Structure brouillée car les Thargoids ont compris que nous hackions leurs systèmes). Ces derniers contiennent un échantillon audio ainsi que des informations textuelles menant vers d’autres Structures Inconnues. À partir d’ici, à vous les analyses du dernier chapitre ! 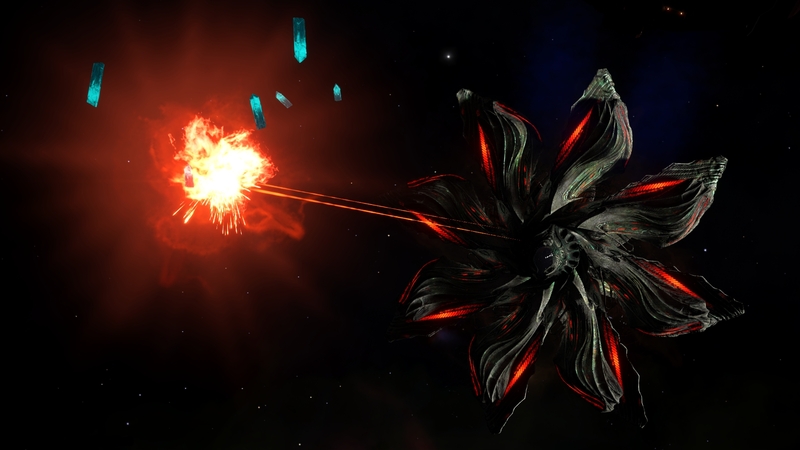 Adding a Guardian item to one of the three required Thargoids objects will create a violent reaction the central Device. Be warned! These sorts of Thargoids drones are very busy and won’t pay attention to your actions. However, they will retaliate if attacked, with caustic spit in melee, or by ramming your SRV. We think they are taking care of the ‘eggs’ on the ground and repairing the places that seem to be greatly damaged. These scouts are composed of four different types. You can find them in non-human signals with a threat level between 4 and 8. Depending on the level, they will be more or less numerous (~3/20), and sometimes accompanied by an Interceptor. 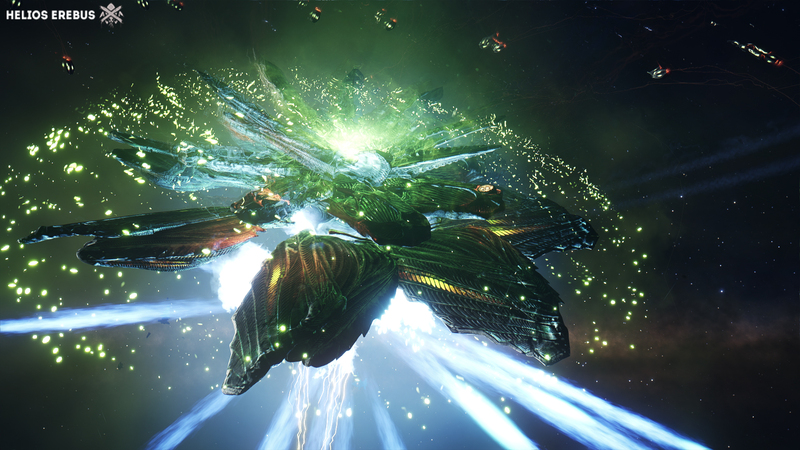 Berserker, regularly enhancing the speed and damage of its Thargoids friends. Scouts are way smaller and more agile than the Interceptors. Their main weapon, a fast-firing energy weapon, is quite weak even though some of the damage passes through our shields. This vessel can be destroyed very easily in a single burst from our recent Guardians weapons. They also have some caustic missiles, so be vigilant. Their strength is their number and various buffs; You have to focus the right Marauders: let’s say Incitators > Regenerators > Berserkers > Others. Above all, they don’t regenerate like the Interceptors and are vulnerable to conventional weapons. AX and Guardians are of course advised. Get precise weapons with fast projectiles, if possible kinetic, and this will feel like fighting a swarm of buffed Eagles. 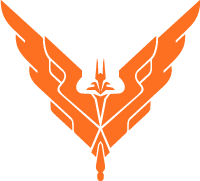 By the way, the Pilots Federation consider them as Elite targets; It’s a great way to rank Elite Combat. 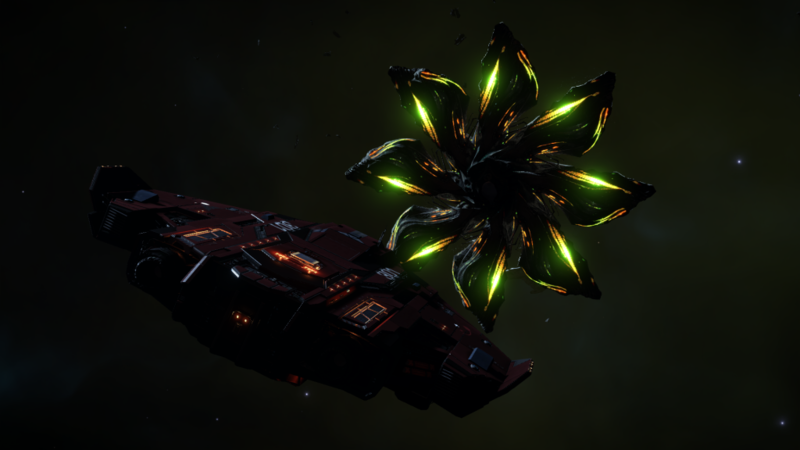 The first living Thargoids ever encountered, these Interceptors are the weakest of the three. Still, they can blow you up pretty quickly if you are unprepared. 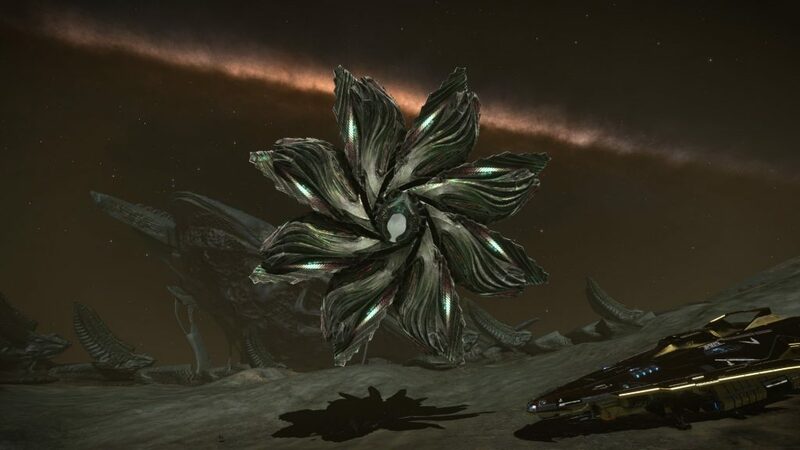 Encountered in non-human signals threat 5 or 6, they are originally non-hostile but will attack if they feel provoked (repeated scans, too close …), or if you carry Thargoids items… and of course if you attack them. They have four hearts 20% hull each, and a swarm of 32 Thargons. They got weapons firing thermal/caustic red shots at you, yellow lightnings in melee combat, and dangerous caustic missiles. 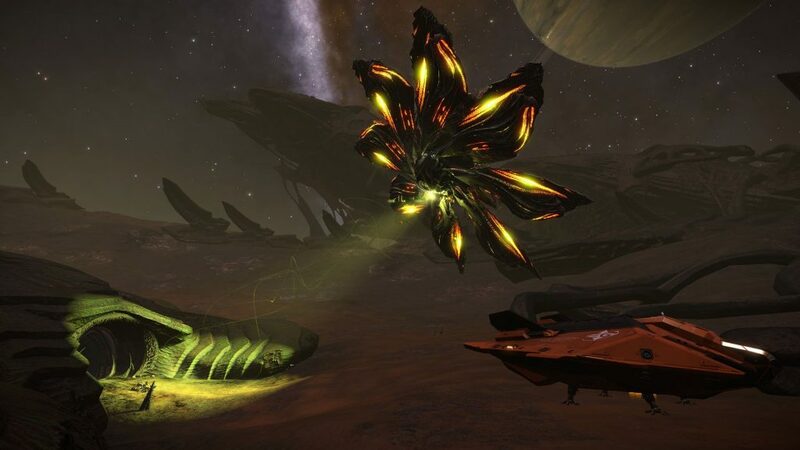 Encountered in non-human signals threat 7, they are originally non-hostile but will attack if they feel provoked (repeated scans, too close …), or if you carry Thargoids items… and of course if you attack them. Basilisks are more easily provoked than Cyclops. They have a darker colours and red marks. We believe that they are older Cyclops, veterans. Their offensive and defensive abilities are significantly greater than the Cyclops. They have five hearts and their swarms are twice as big: 64 Thargons. 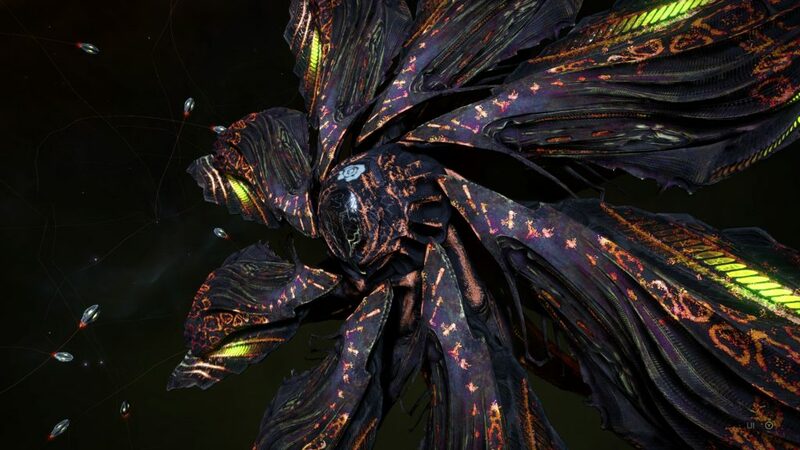 Finally, there is an additional difficulty: if you do not destroy a heart in less than seven minutes, the Thargoid will deploy a new Thargons swarm. Encountered in non-human signals threat 8, they are easily provoked, very powerful and the origin of the first assaults on human stations. 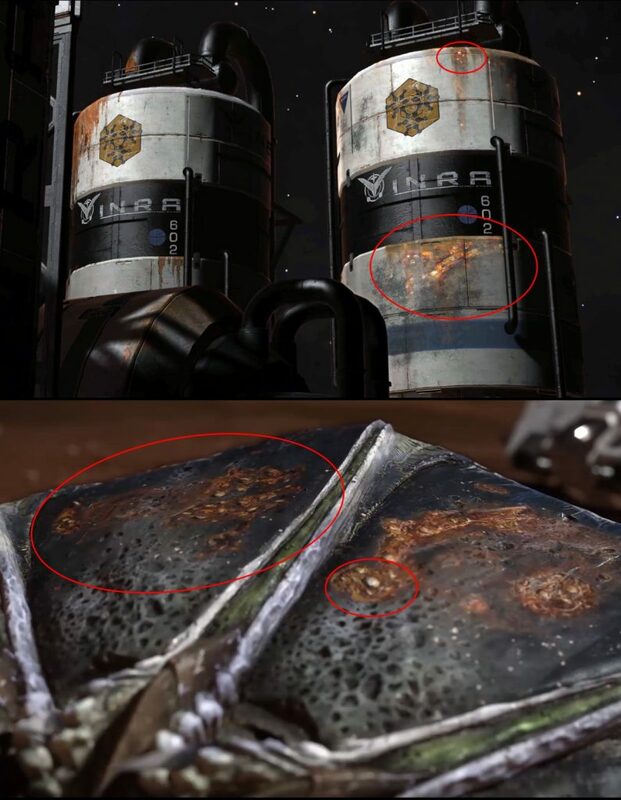 Their design is quite different as well and look more like the Thargoids Structures on the surface, which are suspected to be crashed motherships. They have six hearts and very large swarms of 96 Thargons. They are even more powerful and resistant than the Basilisk. In addition to having to destroy hearts in less than 7 minutes, the Medusa’s hearts are slightly rotating on themselves, making them harder to hit. Encountered in non-human signals threat 9, I advise you not to tickle them… unless you are really prepared and equipped with anti-caustic mods and modules + the best weapons and ships the galaxy can offer. Because if you aren’t, you will soon regret your decision, and eat water for dinner. They have eight hearts and gigantic swarms of 128 Thargons. The most powerful Interdictor known to date. They were discovered near the Cone Sector and are appearing now more often in the human bubble. 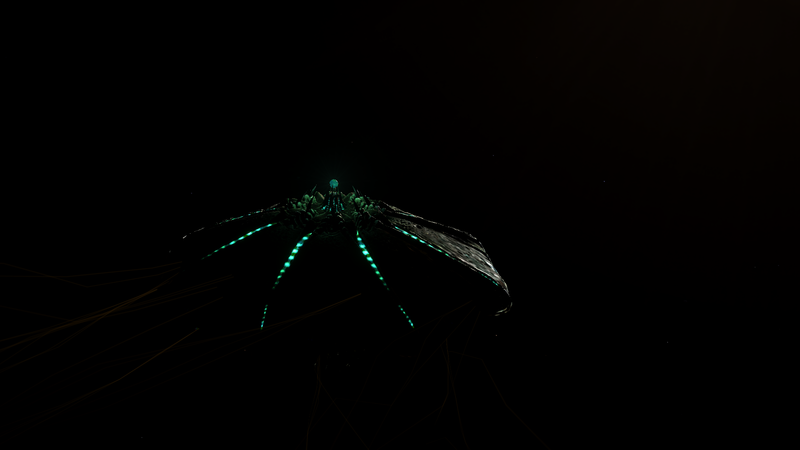 They are contained in the Cyclops, Basilisks, Medusas and Hydras Interceptors and fly in swarms. Unharmful alone, they are quickly lethal in swarms if you don’t pay attention to them. Their caustic focused shots inflict great damage and they can even turn into missiles to inflict heavy damage. At very short range, they can also inflict some damage from the same yellow lightnings as Interceptors. Kill them with your Flaks. 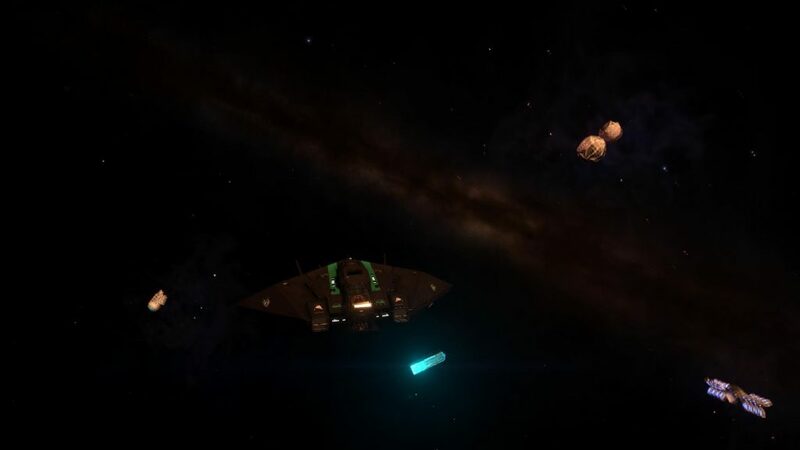 The Thargoids ships are originally peaceful as they scan and retrieve items around them; They approach us when we arrive with a green light signal, some Thargoids noises as well as sequences of numbers they send to the bottom left of our scanner. These “Interceptors” ships also have some markings on the front; There are many different markings. These are discussed a little further down. 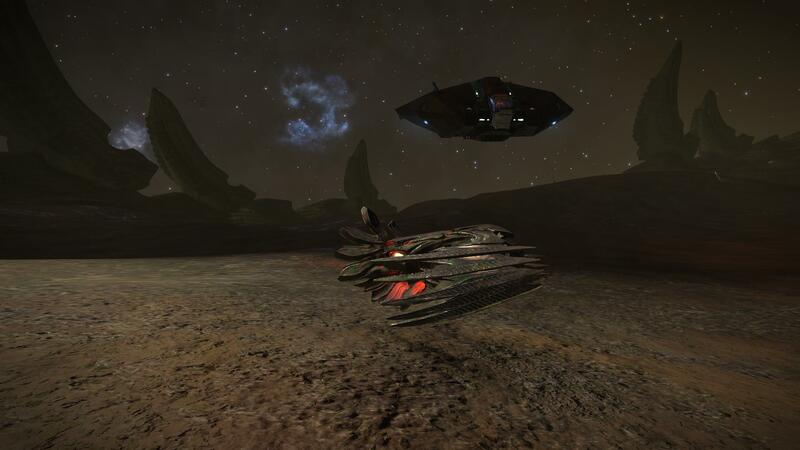 If we deploy our weapons in front of them, the alien will do the same and will also release a Thargons swarm. If you get too close to the debris, its light will turn red and you will have about fifteen seconds to pull back; They don’t want to be interrupted while doing their stuff. If you comply, its light signal will turn green again and it will return to its occupation… otherwise, good luck for the fight against these xenomorphs commander. 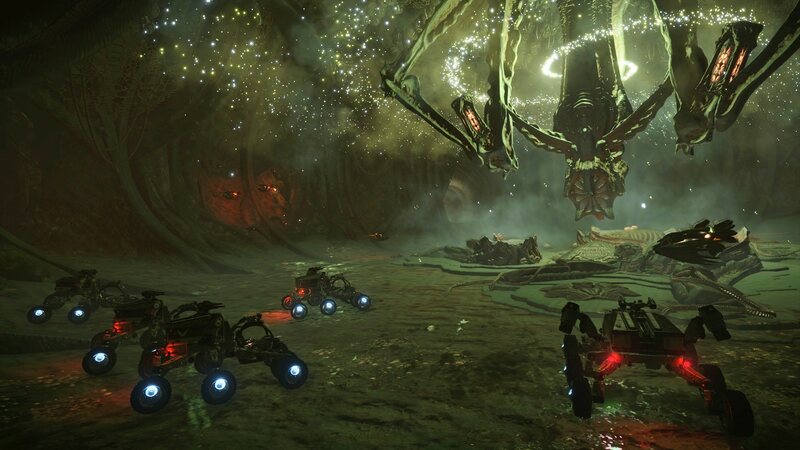 The Thargoids tend to recover some items like Black Boxes, Probes/Sensors, Escape Pods and Meta-Alloys. 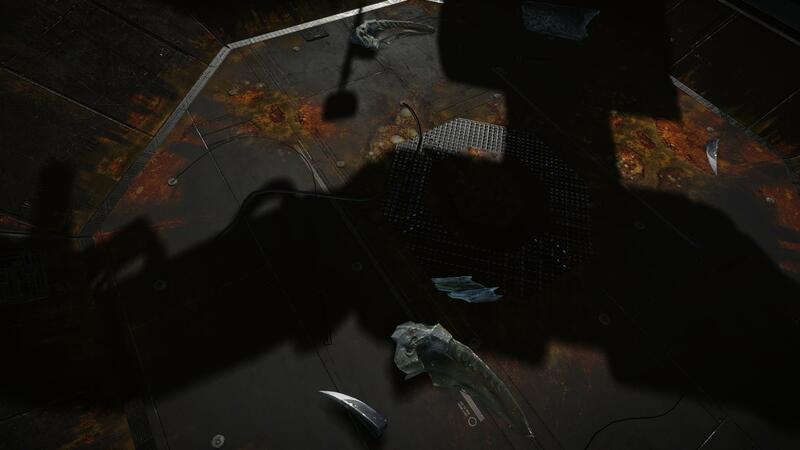 The Gardiens items are immediately scanned and destroyed. 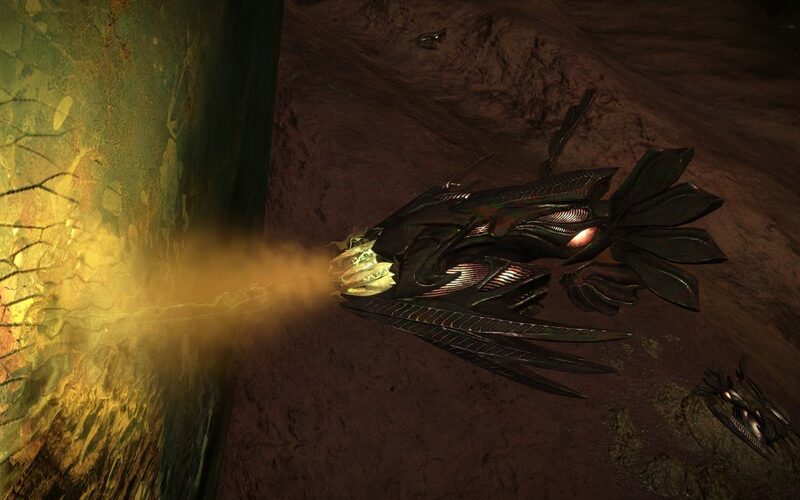 These Thargoids Interceptors have a single burst weapon (the burst is more or less long, depending on the Interceptor’s type) but can also deploy a Thargons swarm, their drones. Very powerful missiles have also been reported, a percentage of the damage passes through our shields. Although a lightly protected human ship will not have a good time under their combined fire, a battleship will stand up to aliens who will perform many strange maneuvers and tactics with their thrusters. The best known at present is the frontal assault then a slide above you while continuing the assault. Do not try to fire your missiles, they will bounce on them. A Shield – Tough against all weapons types, it will take a great firepower to bring down these aliens green shields. 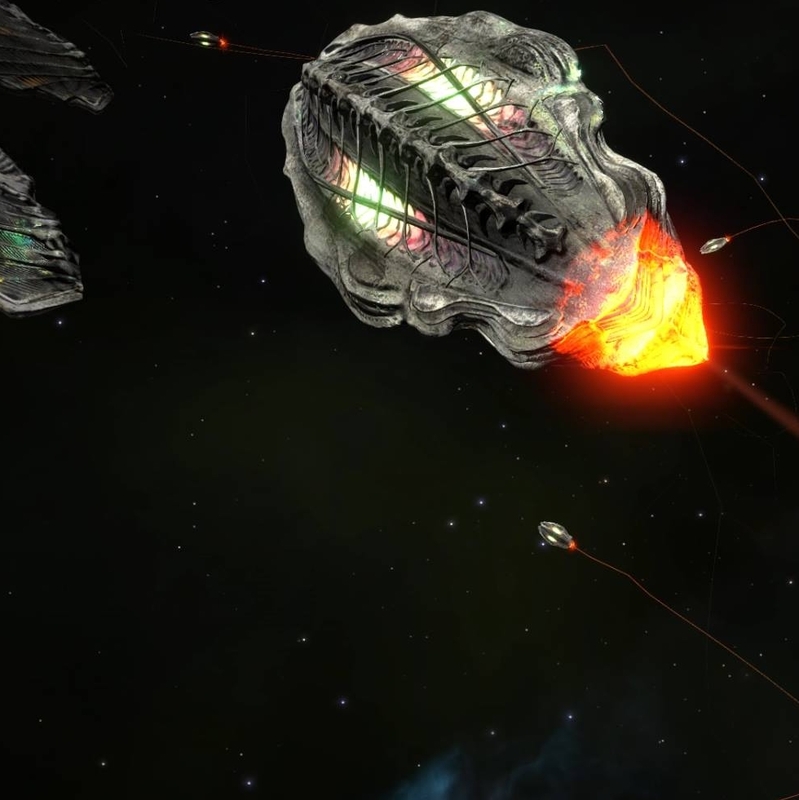 Hearts – Acting as shield cells, they regenerate the Interceptors’ hulls, so you have to destroy them in order to permanently lower the alien’s hull. 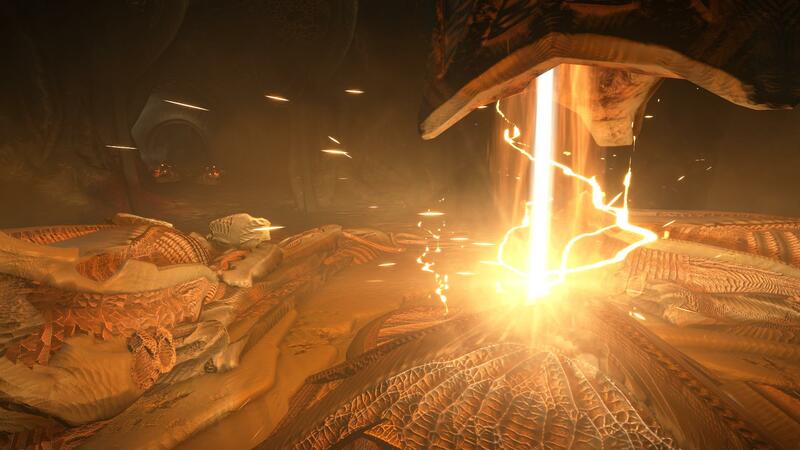 You can only hit them when they glow, which means they are regenerating the Interceptor. 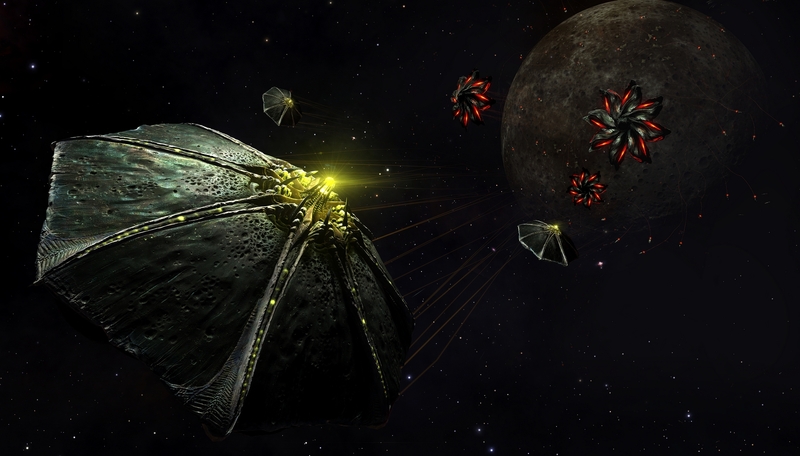 Thargonds Swarms – These drones fly in a swarm and are commanded by the mothership, just like our fighters. They each have a green caustic weapon and can propel themselves into our ships as missiles, to inflict heavy damage and self destruct at the same time. Burst Weapon – The Interceptor has a weapon above its “cockpit” or “eye” firing red ammunition and inflicting caustic effects. These two very ancient sapient species fought long ago; A very long time before the first steps of the human race. 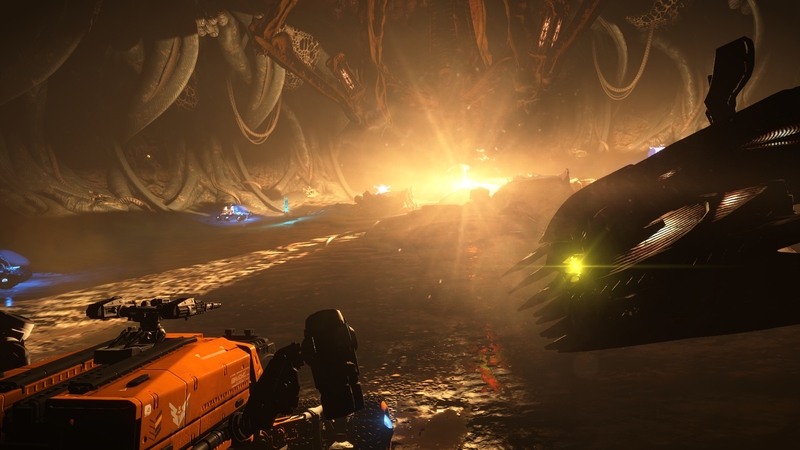 The Thargoids sowed a number of planets with Barnacles, in what eventually became the Guardian’s space, millions of years ago. 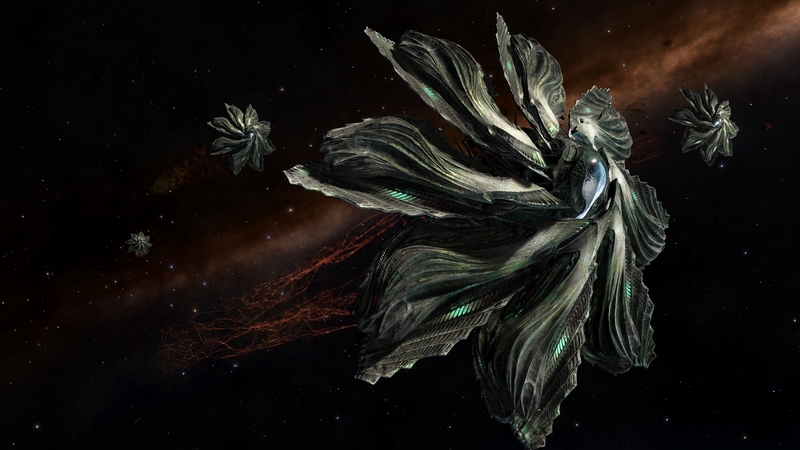 As we know, the Thargoids Barnacles are designed to extract resources from a planet and turn them into meta-alloys, an essential ingredient in the creation of Thargoids vessels and technologies. 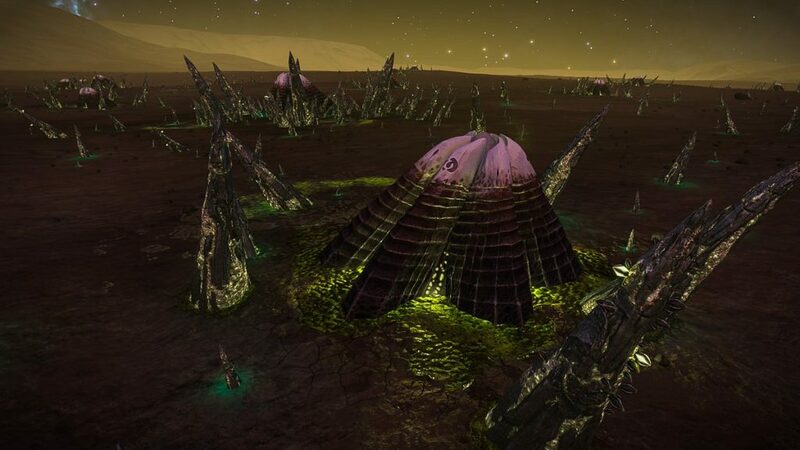 The Guardians have assumed that for the Thargoids, seeding a planet with Barnacles is an important occupation process. They were quite right. 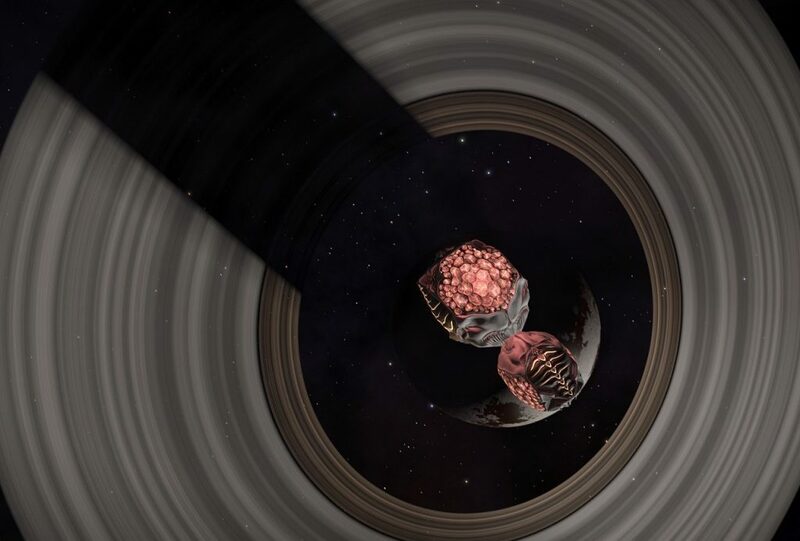 Thousands of years after they planted planets – in Guardian space, with Barnacles – the Thargoids returned. Of course, they discovered that the planets they had worked on were now occupied by the Guardians! The Thargoids immediately launched an assault, making no effort to communicate with the Guardians. At some point after the start of the war with the Thargoids, the Guardians were forced to make a partial retreat. 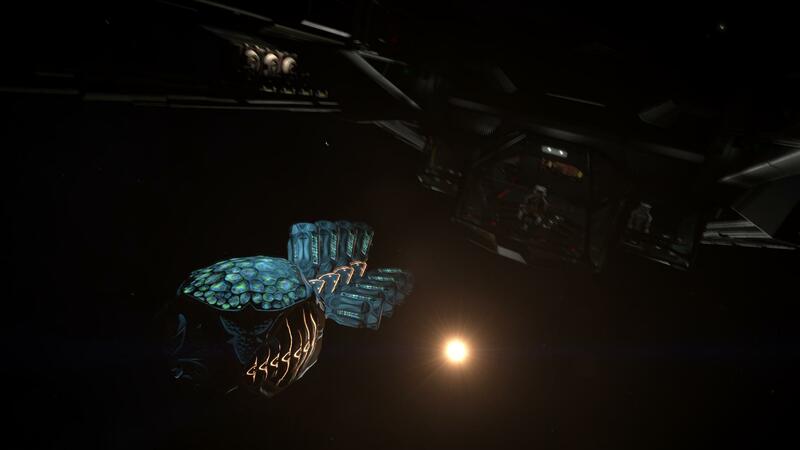 It seems that they were still trying to communicate with the Thargoids, and were reluctant to take up arms against them. 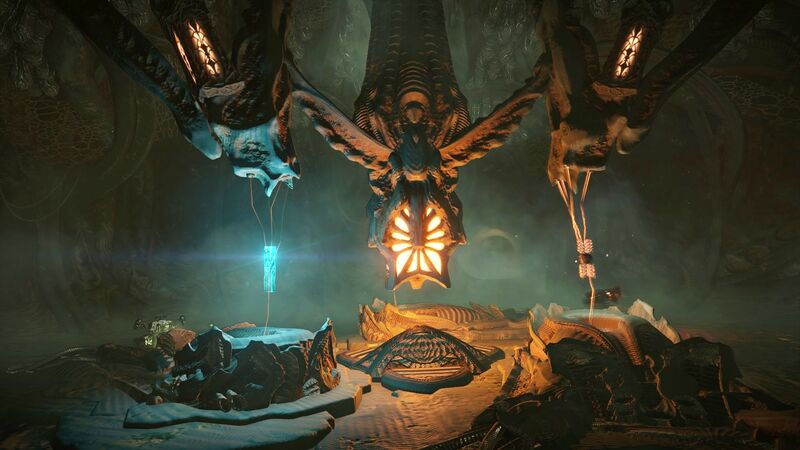 Eventually, they managed to develop a sufficient understanding of the Thargoids language in order to communicate, but that did little good to the Guardians. The Thargoids were determined to keep on fighting, and the Guardians were forced to employ more aggressive methods to counter the threat. At first, they deployed ground troops, but when that proved ineffective, they started using drones: autonomous machines that did not fear fatigue or uncertainty. These war machines became very sophisticated in a relatively short time and were soon able to identify and target anything that used Thargoid engineering. Even more remarkable, the biomechanical technology of the Thargoids has been designed to recognize everything that is of Guardian origin. 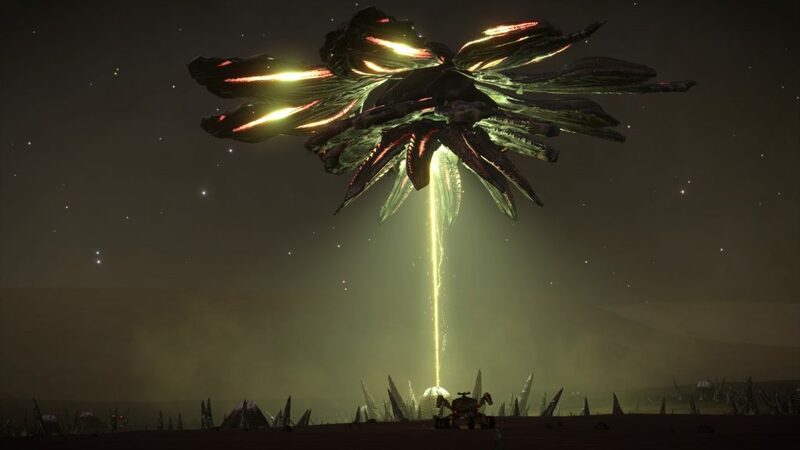 This explains why, millions of years after the conflict, Thargoids devices are still reacting aggressively to the presence of Guardian technology. It appears that the Thargoids entered the Guardian space unprepared for a prolonged military campaign, and after being confronted with a continuous flow of Guardian war machines, they were forced to retreat. The logs also mention that the development of Guardian war machines has created a schism in the Guardians society, which may have started the civil war that occurred later in their history. Learn more about the Guardians Lore. Strangely, the Thargoids use many languages, some of which are even used by the human civilization sych as the Morse or the Binary (Octal). 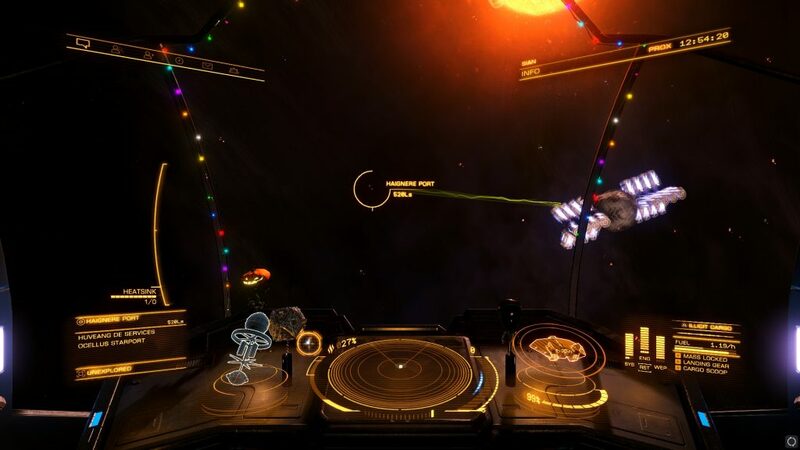 When we target the Thargoids, short messages are displayed on our scanner. 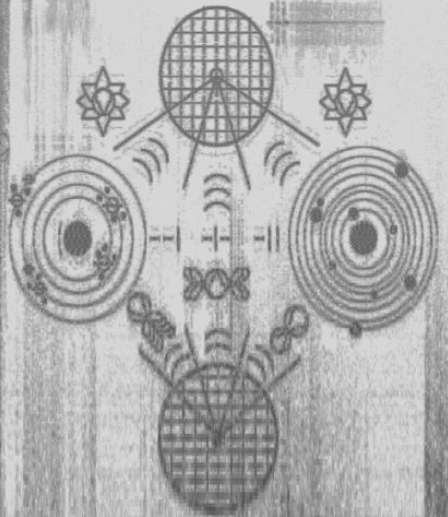 This is an octal code, a system often used by these aliens when they try to communicate with us. Some hidden messages had to be peeled off by playing with colours filters as below. This is a single image. 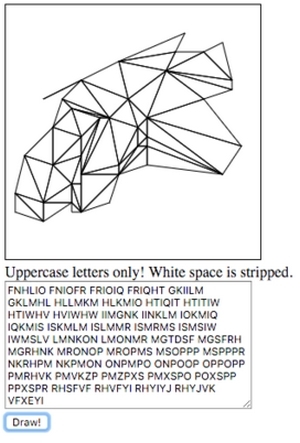 In the end, the code was cracked, here is what it tells us. This could be a, Easter Egg to the previous game Elite’s Manual (1985) on Commodore, we get some variations of “Hull Stress Factor Uncertain – Uncertain Shell Constraint Factor”. We also learn that the galactic community could work on a similar system of offensive drones. The Thargoids Interceptors also display Markings on their bodies/vessels. These differ according to the Interceptors’ types as well as other unknown factors may be a social rank, a role or an age. 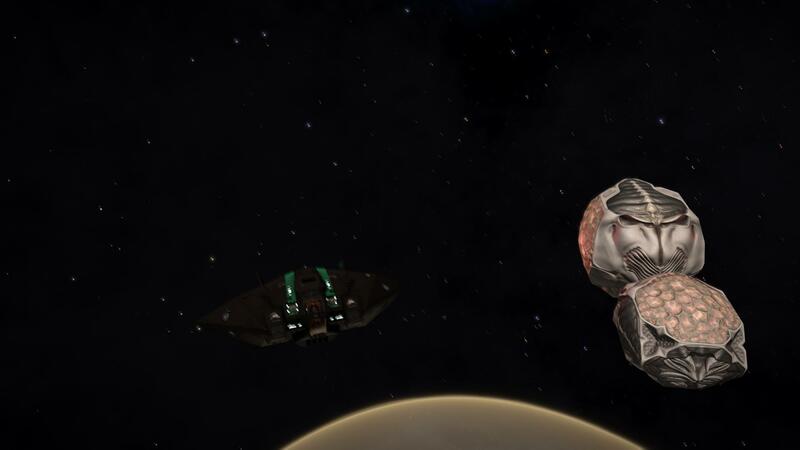 The Medusas are old, veteran fighters while the Cyclops are much younger. So far, we don’t know exactly what these markings mean. Eagle Eye is the name given to the multiple installations produced by AEGIS, leader in research and defense against Thargoids. 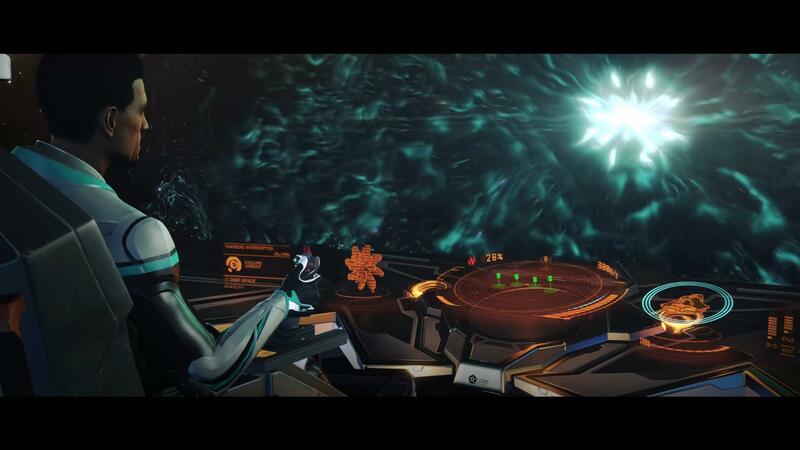 After they got their laboratories destroyed in many stations by the Thargoids, a counter-intelligence operation was set up in order to be able to determine the systems assaulted by the Thargoids: Eagle Eye Installations. You can find these installations, from #1 to #6. These installations contain a satellite transmitting data encoded in CAESAR code. 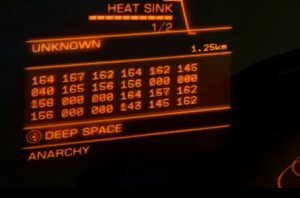 With the right key, we can decode this message and get its content: the satellite gives the name of a system and where to find the spied Thargoids Structure. The Thargoids communicate with us, on a base 8, from 0 to 7. 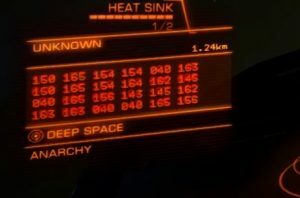 We have been able to understand this after activating our Scanner near a Thargoid Probe. The latter activated and then partially disabled our ship while emitting strange noises in our cockpit. The sound has been translated into an image, a sort of map. On the left, the system Merope: number 1. 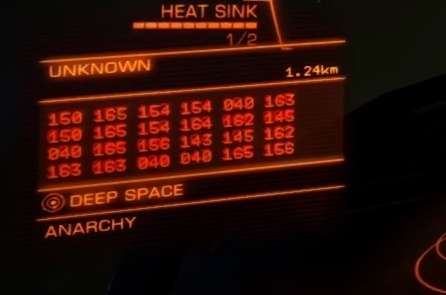 The closer we are from Merope, the closer the number is to 1. 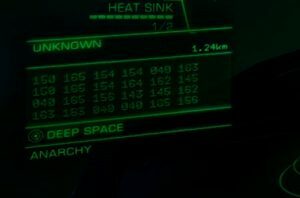 When we move away from Merope, the number becomes smaller or bigger than 1. By taking three random systems and their coordinates X Y Z in the galaxy map, we can obtain their values. These are obtained via EDSM and the value is obtained via the Pythagorean theorem to calculate the distance of a system from two other distances. You have this equation with 4 unknowns if you like maths. Then triangulating these values ​​gives the following coordinates: 687.07, -362.18, -697.24. The system closest to these coordinates is Col 70 Sector FY-N C21-3: the system on the right. We can check this using a large number of systems and their coordinates/values, we will always get the system discovered above. Now, how to processes the Thargoids Links that we discussed previously. We know they’re pointing to destinations. 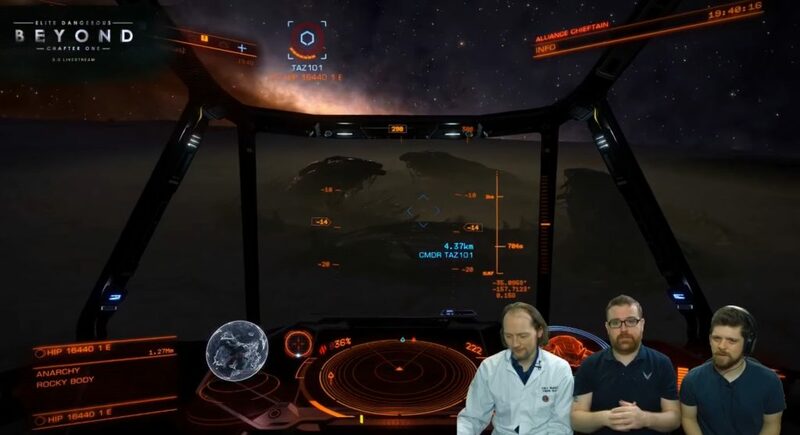 Go there, don’t forget your Thargoid Probe and Sensor. Open the gate, enter, collect a Link, prepare the Device and scan it to receive audio messages. This is our destination system. Go there, normal space, drop your Link, play the audio and… woot, the Link is pointing where the Thargoids are preparing an assault! Repeat the proces until you’re close enough to confirm the target. Repeat the processes for each audio messages. Well done, you’ve processed one Eagle Eye Installation! 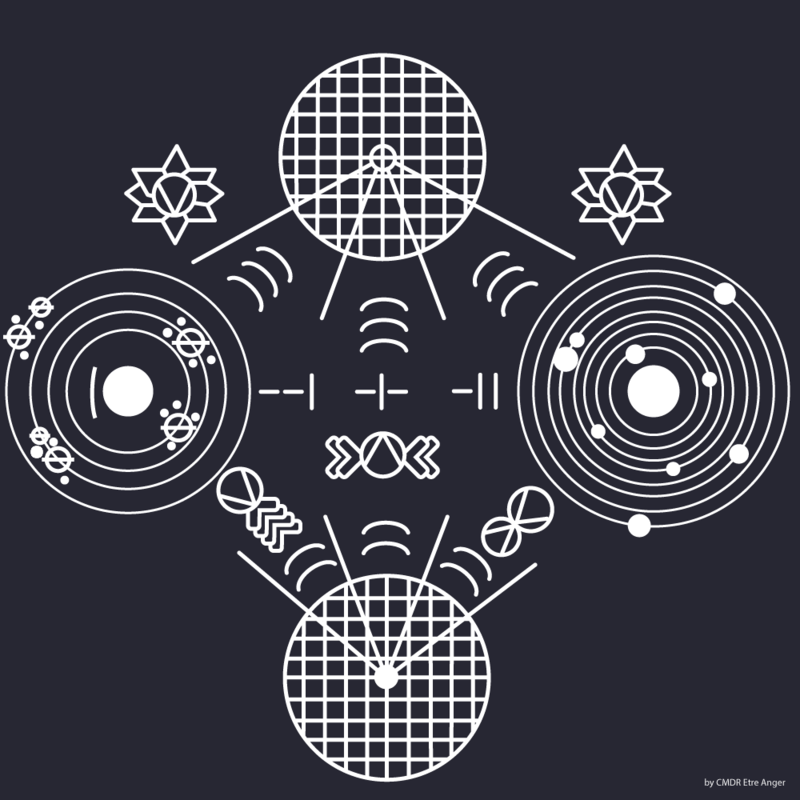 Bonus for those who love science and want to push the ting further, by fully understanding the high and low frequencies from the Thargoids messages. 2°) Decoding in binary, with high frequencies representing a 0 and low frequencies a 1. These systems are supposed to represent the distances between unknown systems and specific reference systems; As in system I, 0.157 units from reference 1, 0.031 units from reference 2, 0.960 units from reference 3. 6°) After long tests, we emitted the following hypothesis. The unit of distance is the same used by the Probe: 871.018 LY (The distance between Merope and Col 70 Sector FY-N c21-3). Reference 2 is HIP 14909. Reference 3 is Col 70 Sector FY-N C21-3. 7°) It indicates that, for message I, pointing towards an unknown system, we must seek the destination which is… to the wanted system. 8°) The last step is to download the EDDB or EDSM database (eddb.io/api) and to load it into yours. If you know some SQL commands, query your database to get a system that meets all above conditions… and bam, you got your system! 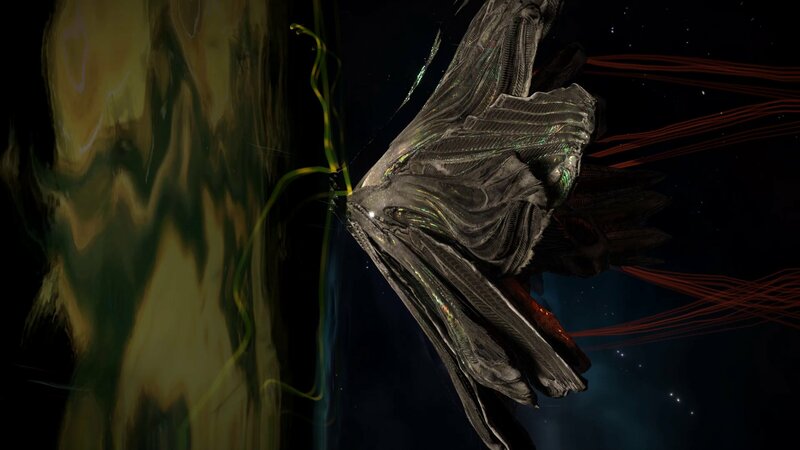 By analyzing each of the three messages obtained via the Thargoid Structure’s Device on HIP 16440, we obtain three systems, two of which were attacked: Bhal and Nauni, which served me here as illustrations. Other Thargoid Structures point to systems/stations that were already attacked by Thargoids previously, but message #2 from HIP 16440 points to Huveang De: yet clear from Thargoids assault. Which means this will also be their target next week, and we have to defend it starting this week. You will find Non-Human Signals here to defeat in order to stop the Thargoid assault. Of course don’t go there right now, as these were examples from week #1. We have to kill around 3,500 Marauders to win, this is a hidden score that we determined with many experiments.